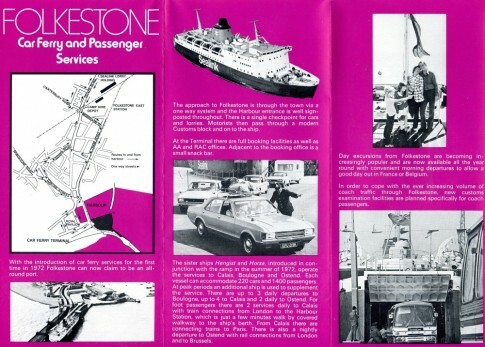 In August 1970, the British Treasury approved the construction of a pair of new multi-purpose passenger car ferries for operation by British Rail from a new Folkestone car ferry terminal. Approval was also given by the Bank of England for the ships, which became the Hengist and Horsa, to be built in France. 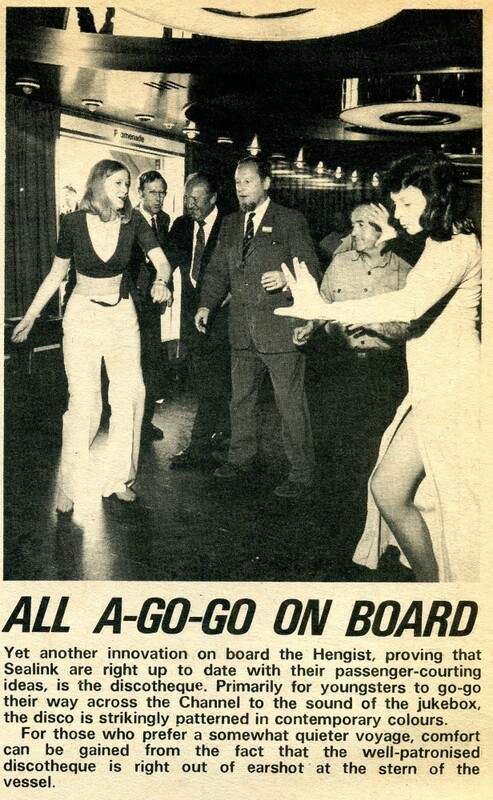 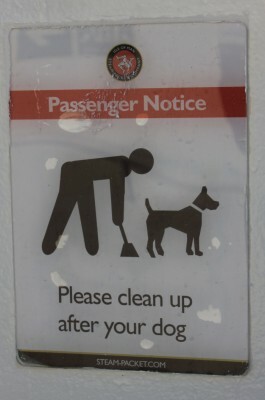 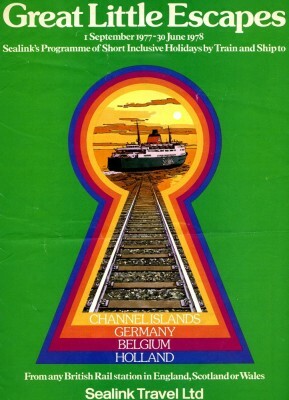 British Rail executives celebrated clearance of “the complete caboodle”, for this had been a somewhat tortuous process, with much political hand wringing and redrafting of the proposals. 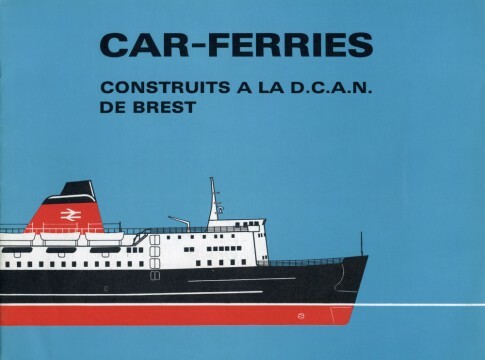 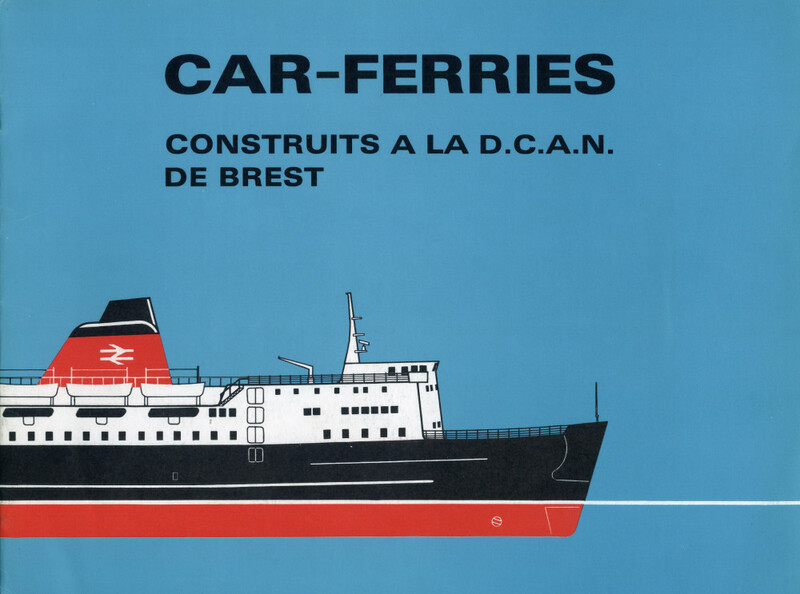 One area which had come under particular scrutiny was what the future would hold for these ships upon the completion of the Channel Tunnel, then expected to be in 1978. 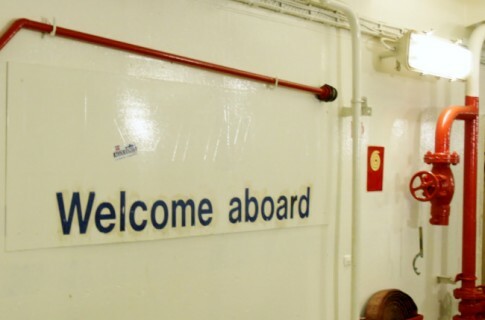 Attention was therefore paid to both the estimated useful life of the vessels and their resale value come the opening of the tunnel. 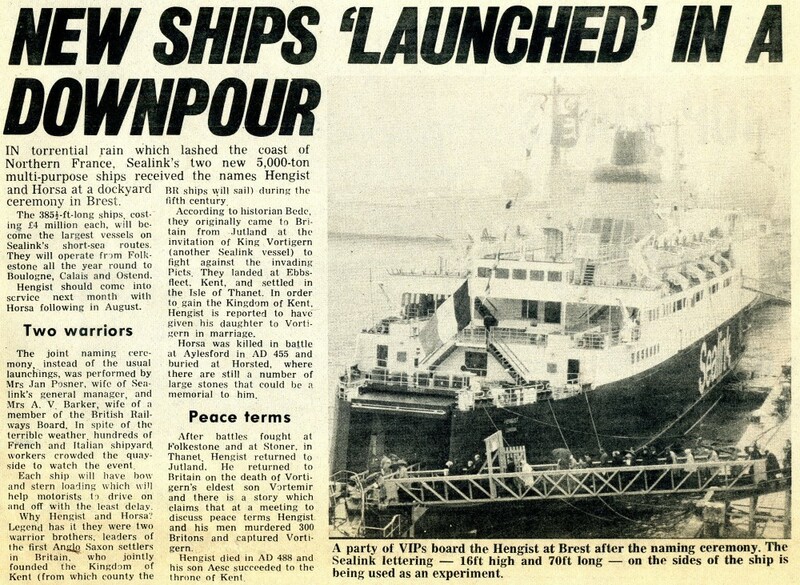 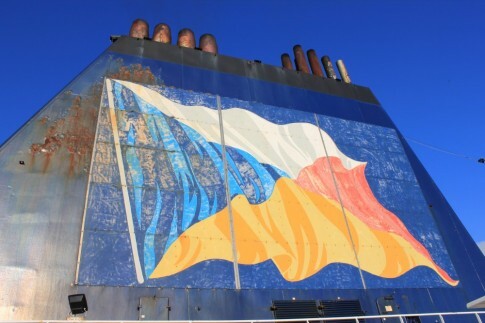 This was of particular importance for the business plan, for the the ships had to make an adequate return by 1978 to cover the difference between their construction cost and, it was presumed, the amount the ships would be sold for in that year. 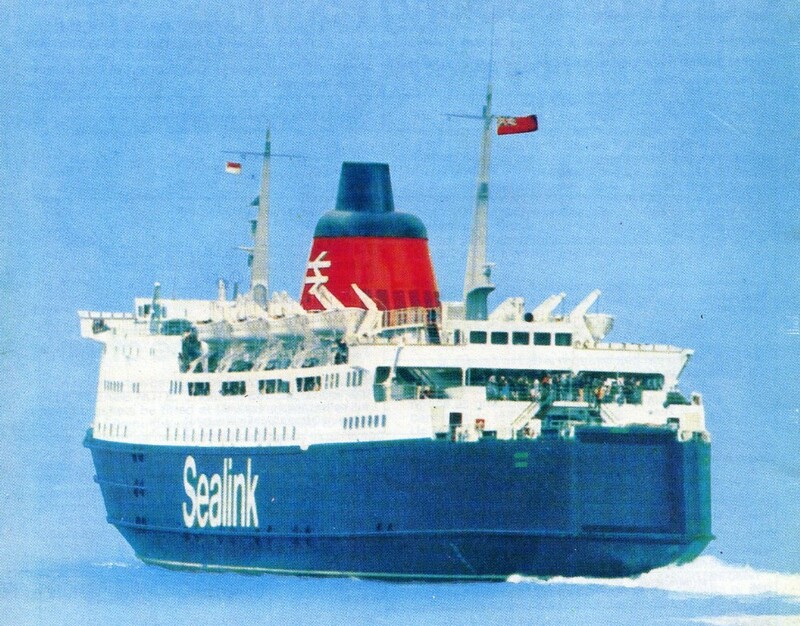 BR/Sealink consulted J S Daniels at the Board of Trade for an independent evaluation and the Daniels memo noted that “it is important that the ships are not so specialised to a particular route and service that they cannot be readily adapted for use elsewhere”. 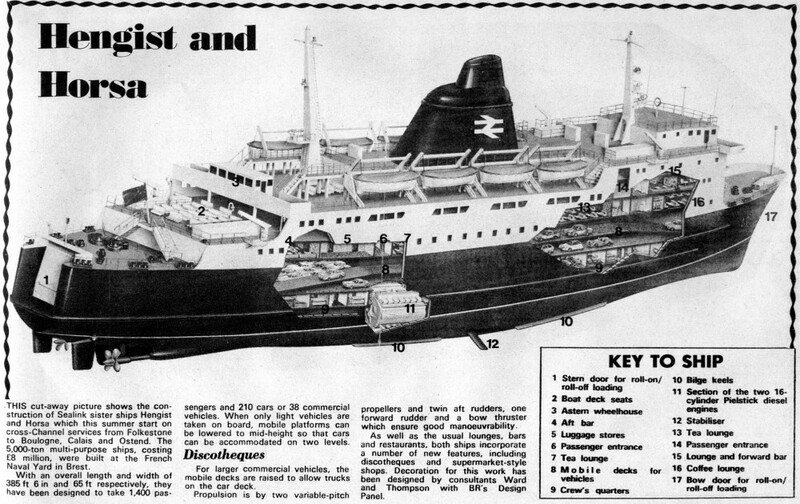 The final business plan assumed a twenty year useful life, with a resale value of each ship in 1978 of Â£2.415m (compared to the Â£3.6m build cost). 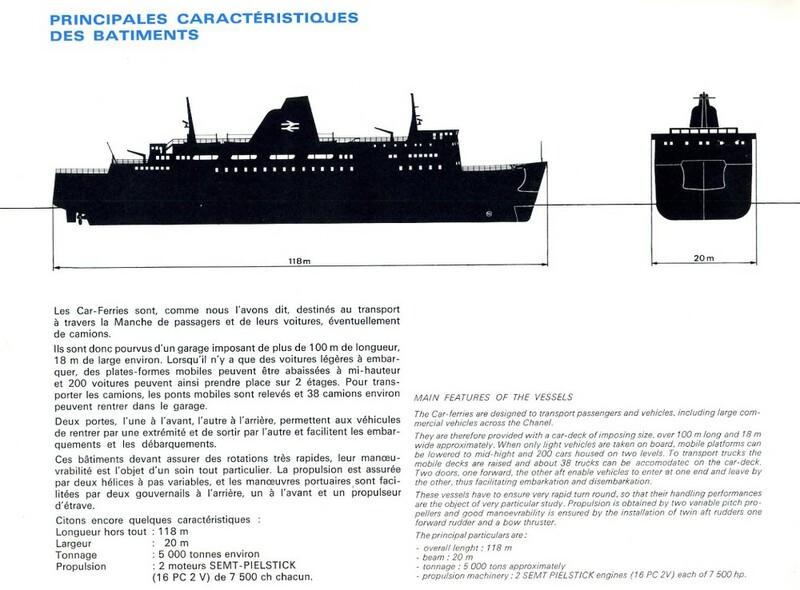 Correspondence with the Ministry of Transport reassured the minister’s team that the ships would find willing buyers and that “there was a continuous demand for this style of ship for numerous Scandinavian, German and Mediterranean routes on which they can be used” although “a need for similar ships will arise on the Heysham/Belfast route by 1981 and it could be more advantageous to transfer them”. 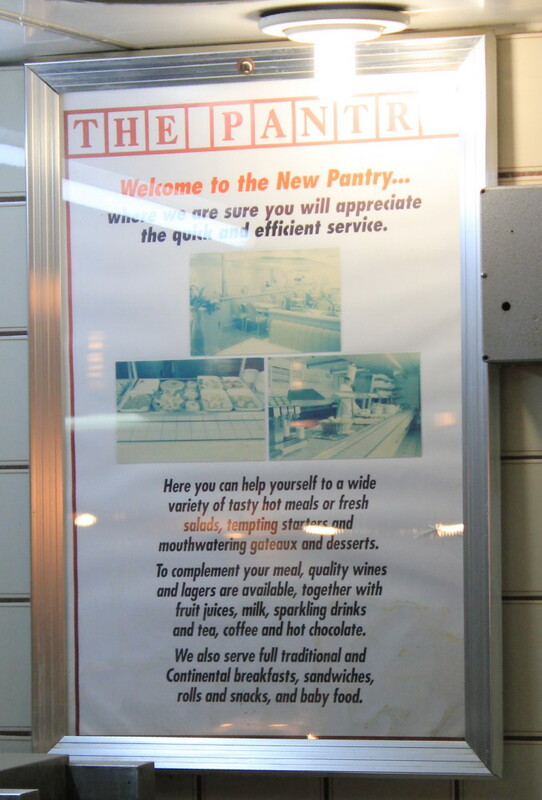 As it turned out, the key assumption upon which this entire section of the business plan was based turned out to be flawed. 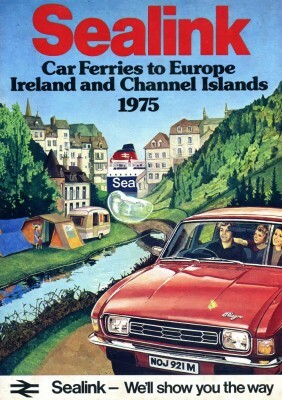 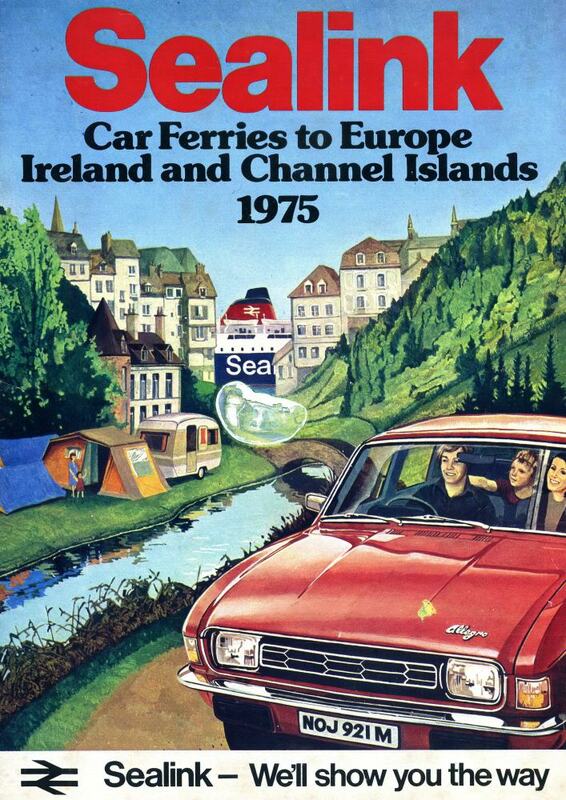 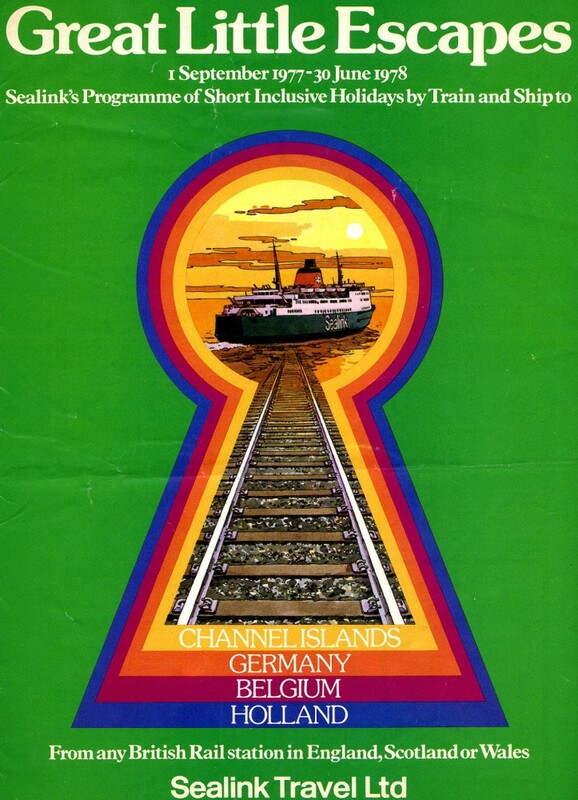 The 1970s Channel Tunnel project was cancelled, and so the ships sailed on. 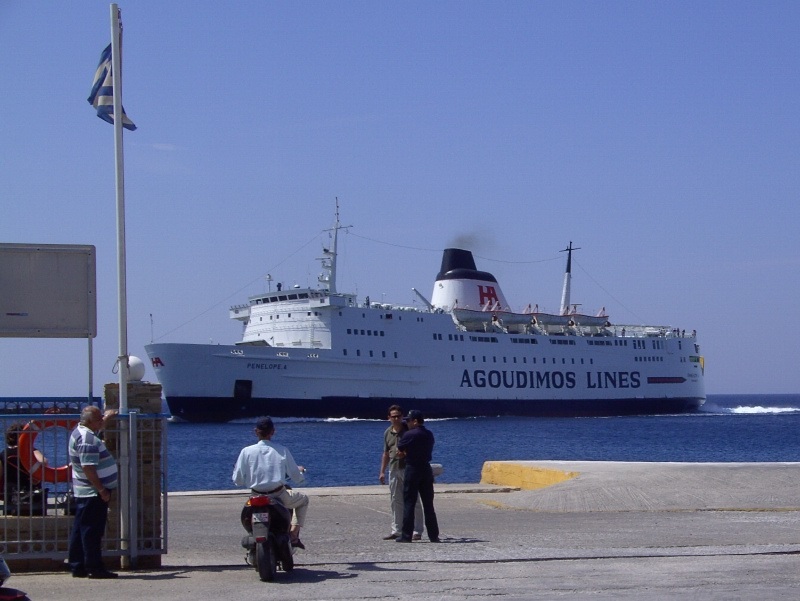 More than a decade later, when the tunnel was eventually authorised, the ships were nearing the ends of their Channel careers and were sold two years before it opened to Greek owners for good prices (when the Hengist was sold by her first Greek owners Agapitos to Ventouris Sea Lines in 1993, the price achieved was approx Â£7.5m). 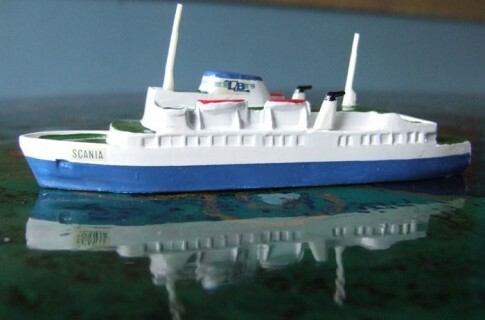 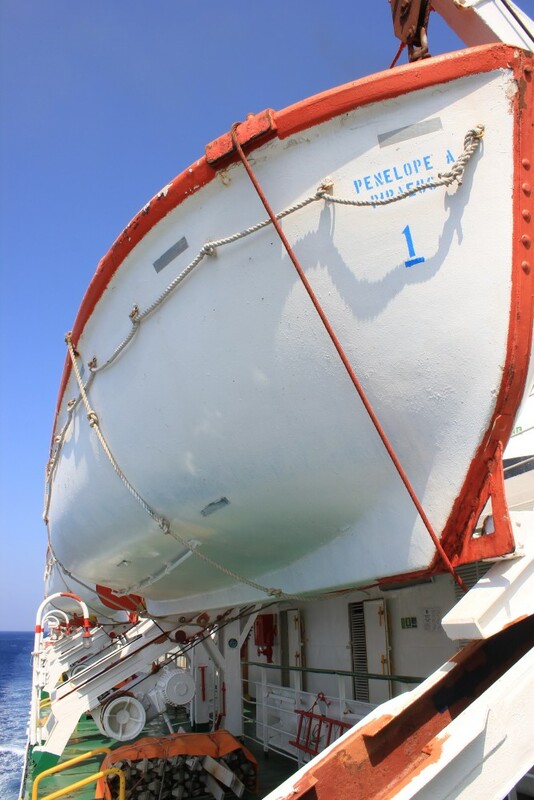 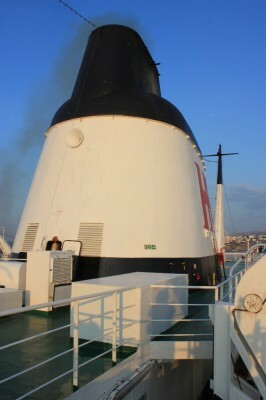 The ships proved more adaptable than J S Daniels could have possibly imagined, almost perfectly suited to Greek inter-island ferry operation in the 1990s. 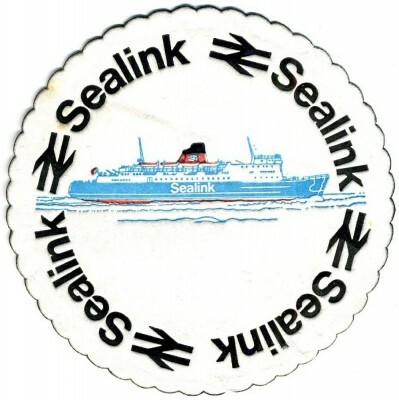 So on they sailed, well past the 20 year lifespan Sealink’s calculations had given them, into their third decades and then their fourth decades and fifth decades. The Horsa passed in 1992 to Agoudimos Lines who placed her in service from Rafina to islands in the northern Cyclades – Andros, Tinos and Mykonos. For four years from late 1999 she fell under Hellas Ferries control as the Express Penelope, but she remained based at Rafina. For more than two decades the port was her home, and she usually sailed through the winter when most of her competitors retired for seasonal lay up. 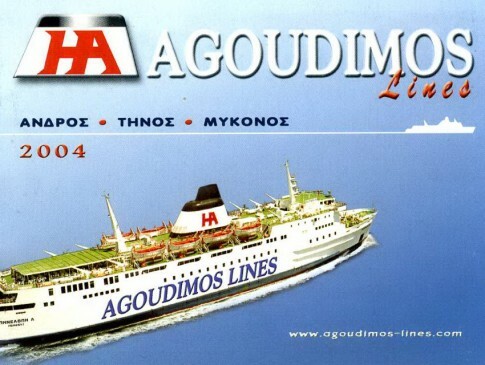 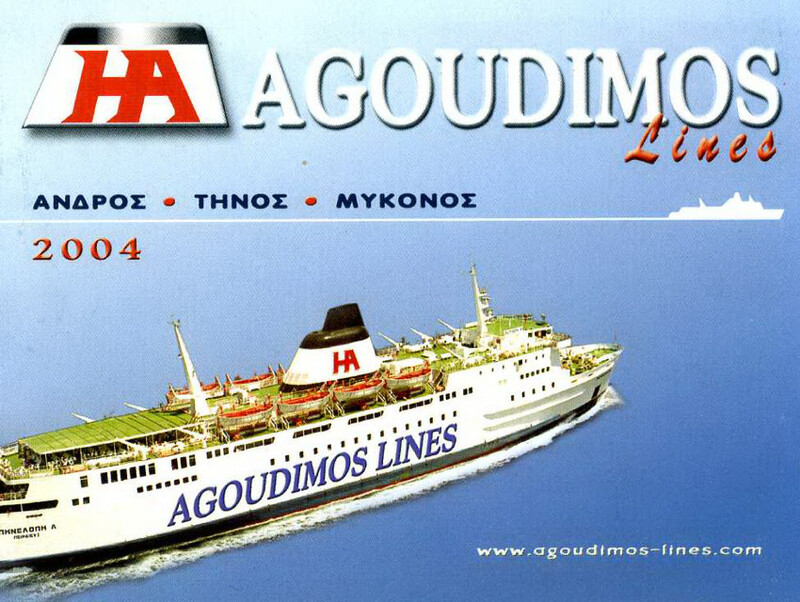 Agoudimos Lines got their ship back in 2004 but by late 2012 the company was in severe financial difficulty and the Penelope A entered a period of uncertainty, out of service. 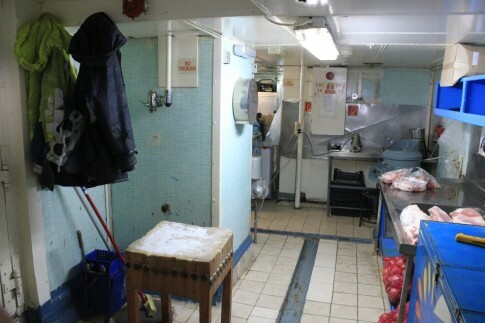 She was in operation around Easter 2013 and then again in late June that year before her crew went on strike over unpaid wages. A settlement of sorts was reached and the ship re-entered service for the summer peak on 23rd July. 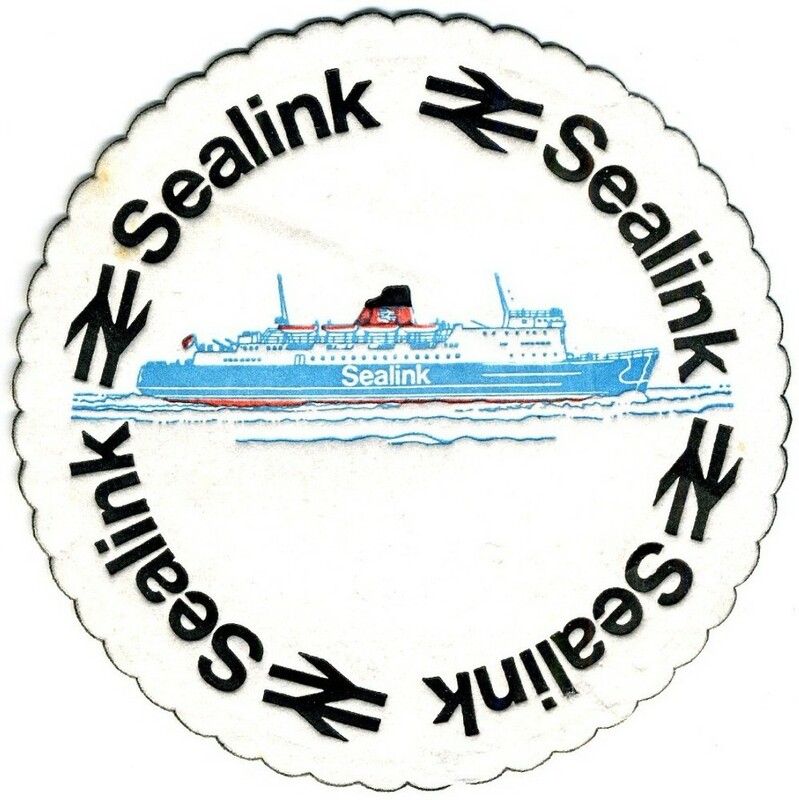 27th August 2013 marked 15,000 days since the ship had entered service at Folkestone back in August 1972. 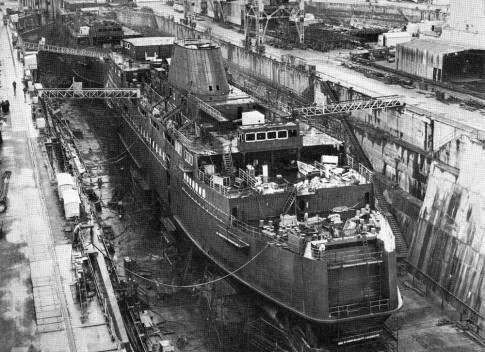 Seven days later came the end, both sudden yet expected – she was again taken out of service by her crew, still largely unpaid. 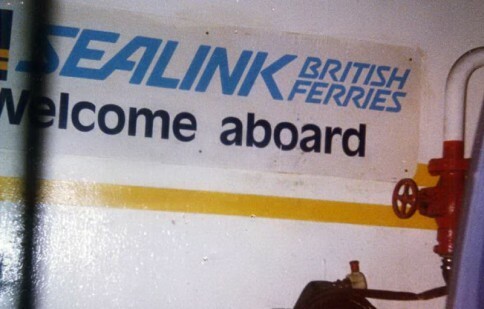 In between times, on 31st August 2013, I made what I knew would, in all likelihood, be a final crossing on this proud old veteran. For the Penelope A (named after Penelope Agoudimos and locally pronounced, Penelope Alpha), this time there were to be no second chances. 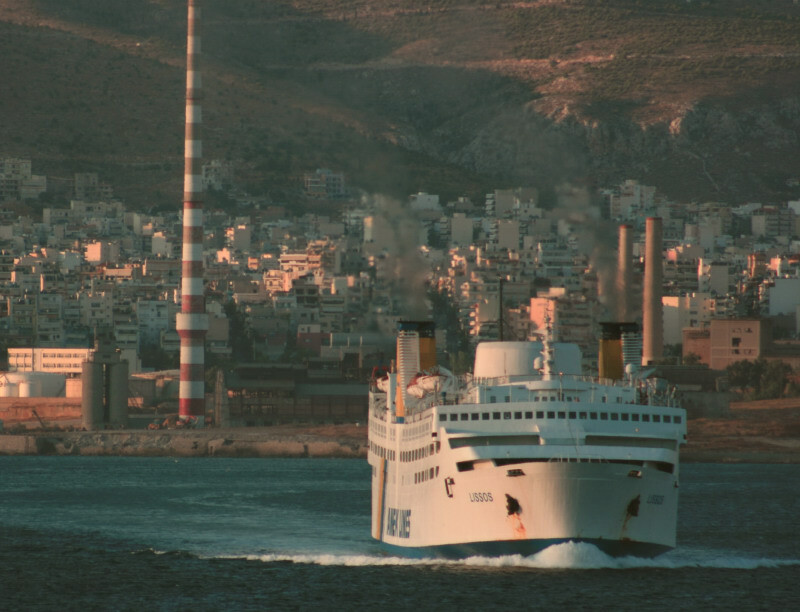 The crew settled down for the long haul, occupying their ship where she lay – in the port of Rafina, prominently at the bottom of the cliffs from the residence of the former Prime Minister. 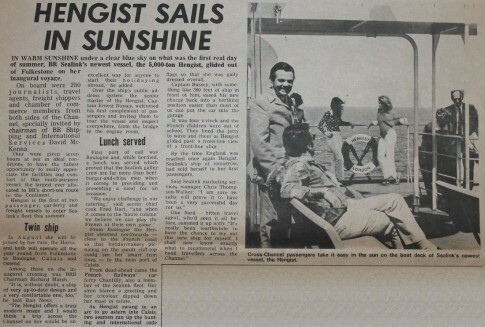 The crew, seemingly abandoned by the operator, ran out of food and power, their plight featured in national and international media. In January 2014 the last crew members left the ship and, eventually, the Rafina port authority paid for a tug to tow the Penelope A, dead ship, over to lay up in Elefsis bay where she has remained ever since. 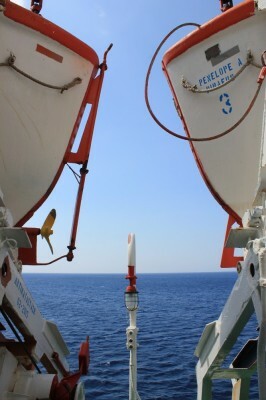 Set out below are some images from that final crossing, four days before the end of the ship’s long career. 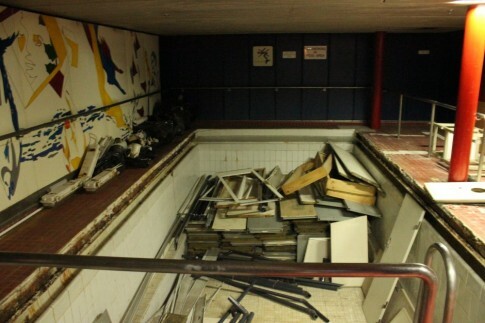 It’s fair to say she had seen better days and, although it is not immediately obvious here, a lack of maintenance and long-term care was apparent. 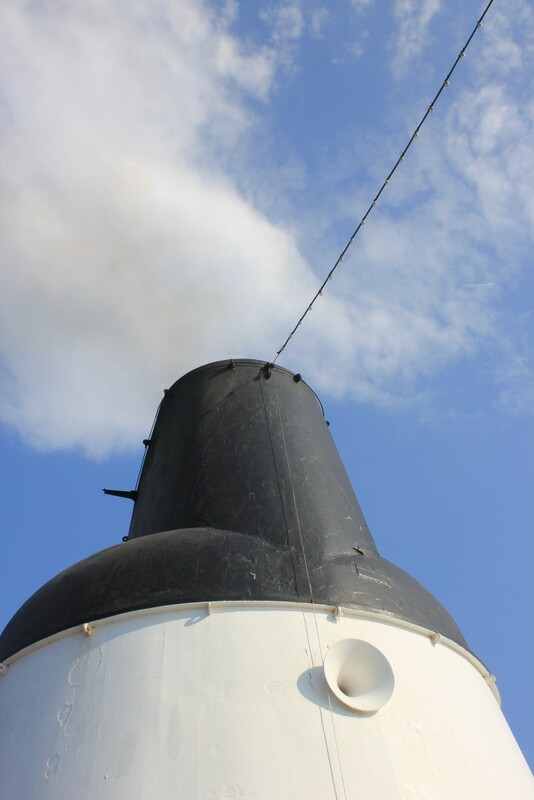 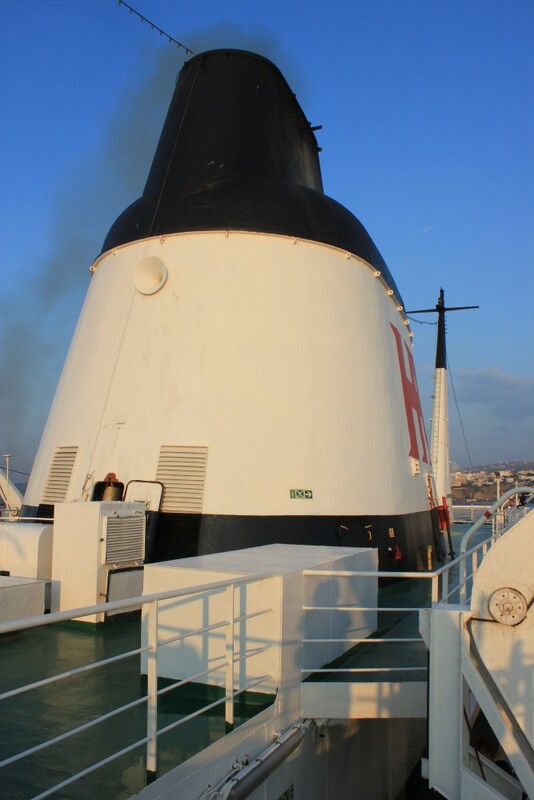 But the ship had lasted in operational service far longer than anyone could have imagined back when she and her sister were ordered in 1970, and it was an honour to be given the chance to sail on her for one final time in her Indian Summer, and to say goodbye. 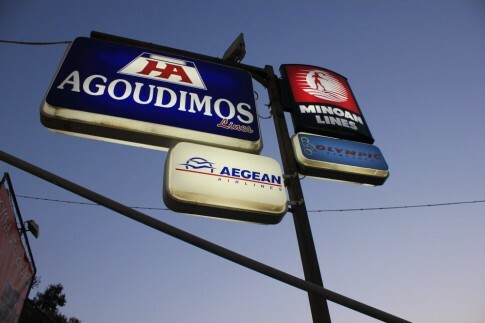 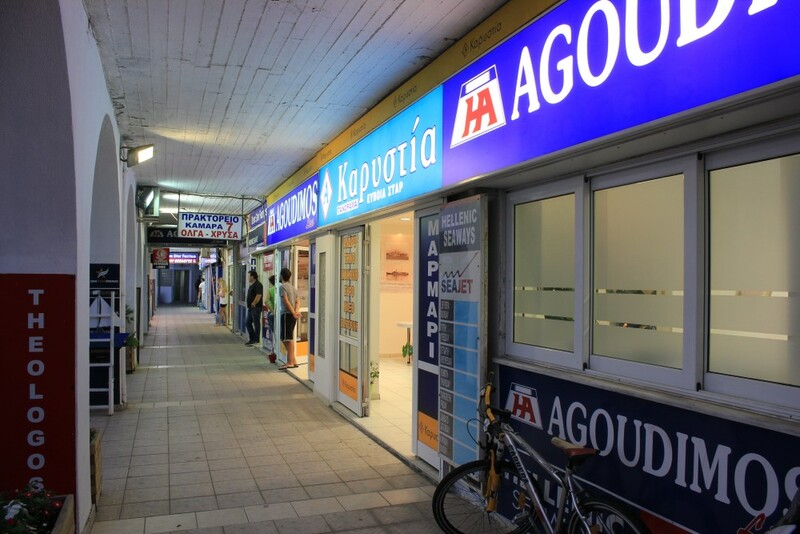 Early morning in Rafina: one of the ticket agencies representing Agoudimos Lines. 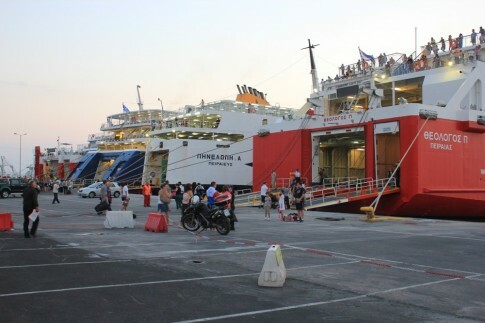 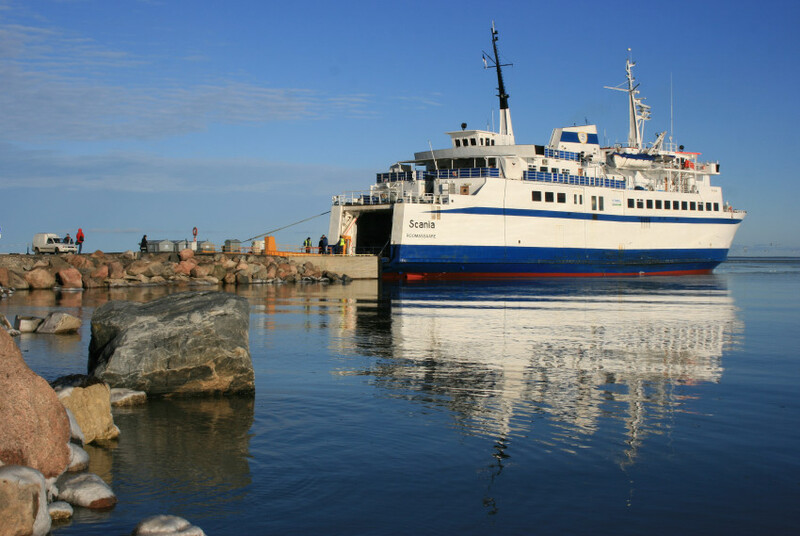 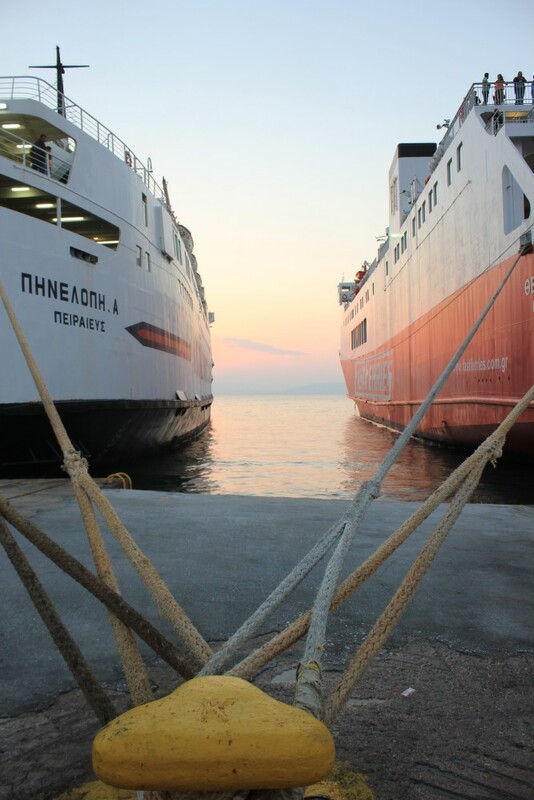 Boarding in Rafina: from left to right, the sterns of the Ekaterini P, Blue Star Ithaki, Penelope A and Theologos P, all engaged in service to Andros, Tinos and Mykonos. 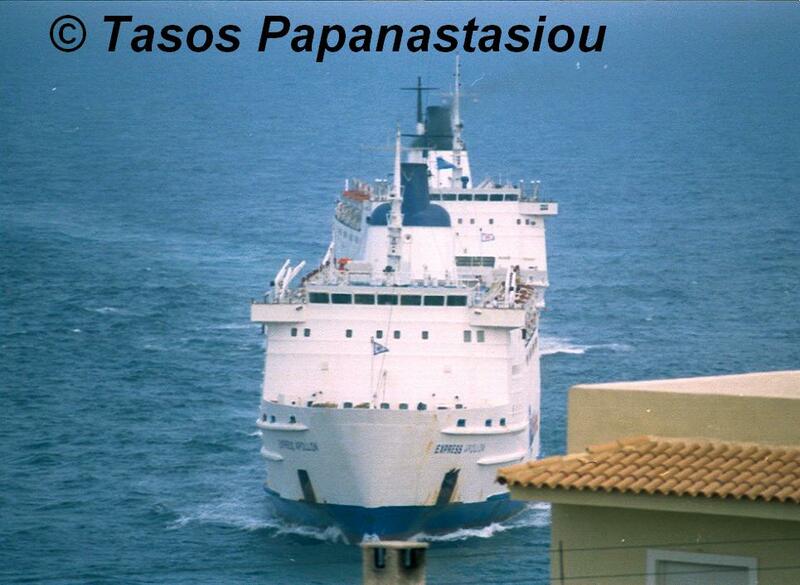 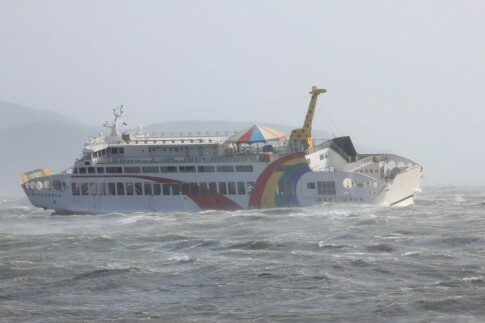 Theologos P of so-called 'Fast Ferries', whose crossing times are no speedier than the other conventional ships. 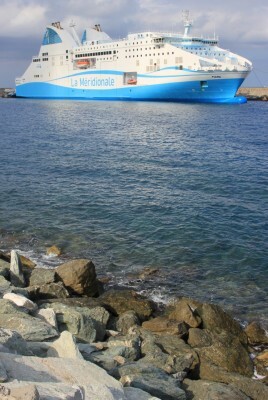 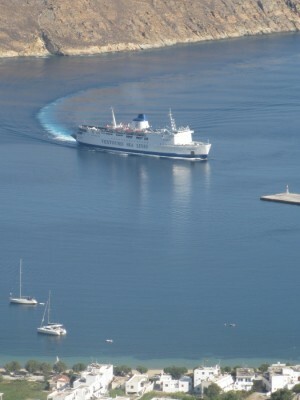 The Penelope A pulling away from Rafina, with the Superferry II (ex-Prince Laurent) on her berth awaiting departure. Plotting our way to Andros, Tinos and Mykonos. 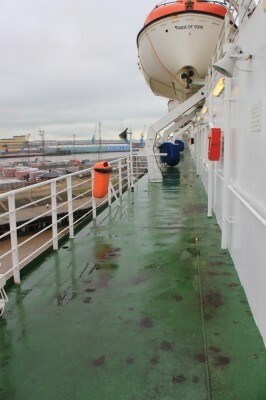 Port side promenade (aft section). 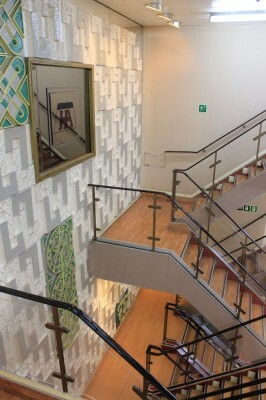 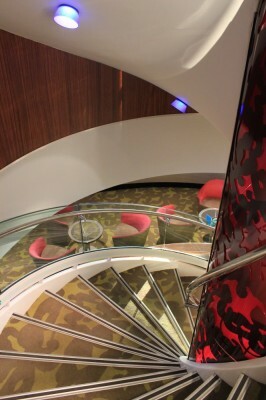 Forward end of the port promenade, part of the Distinguished/First Class accommodation. 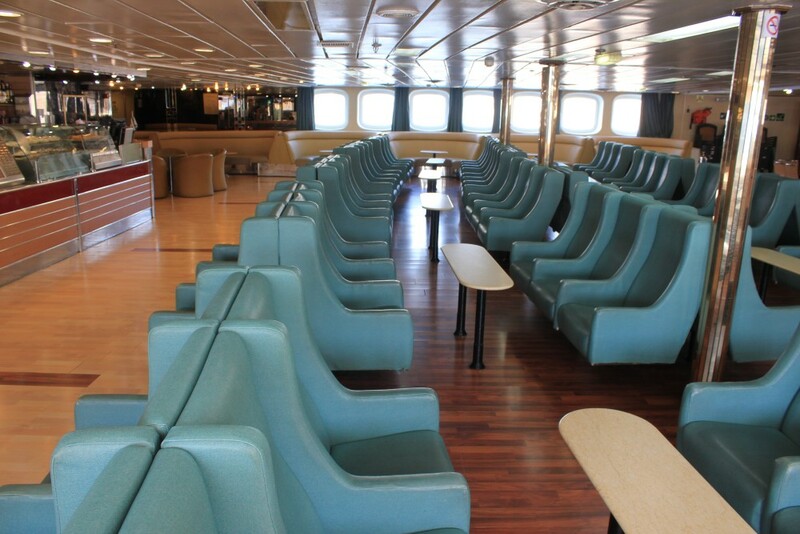 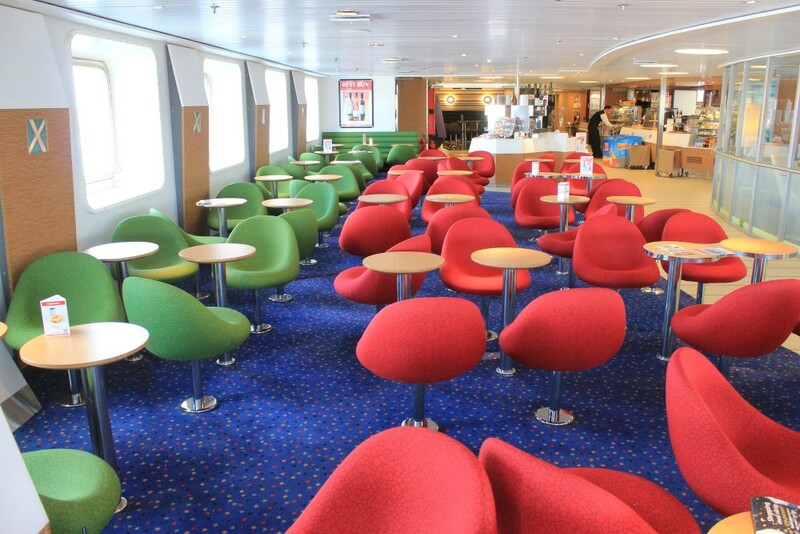 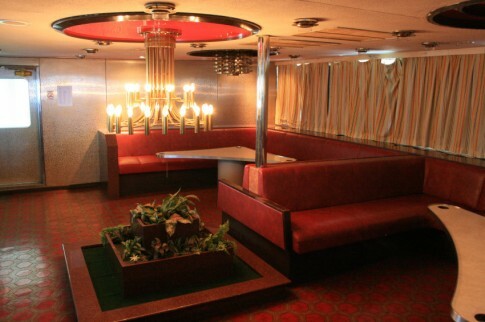 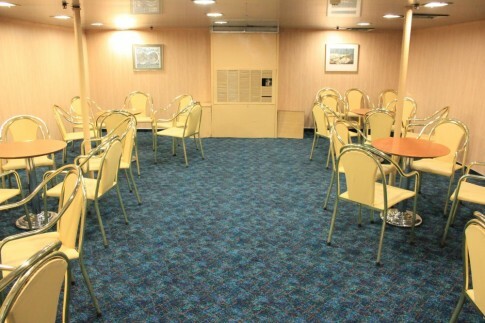 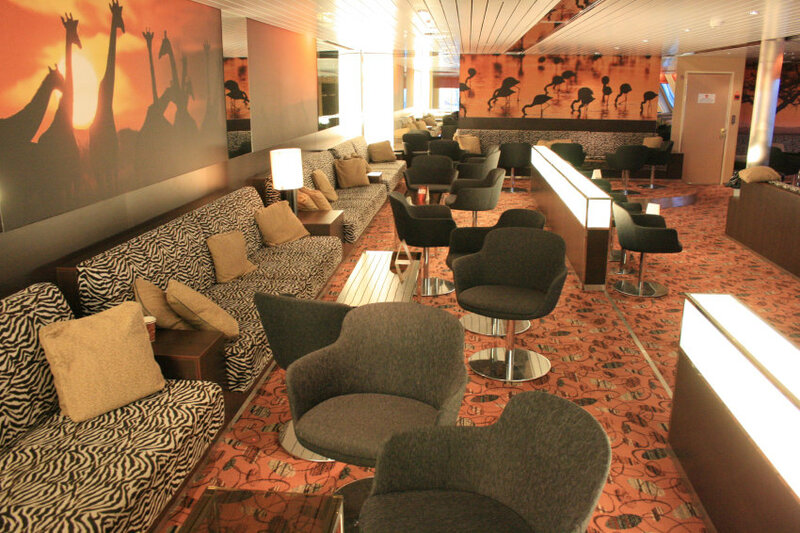 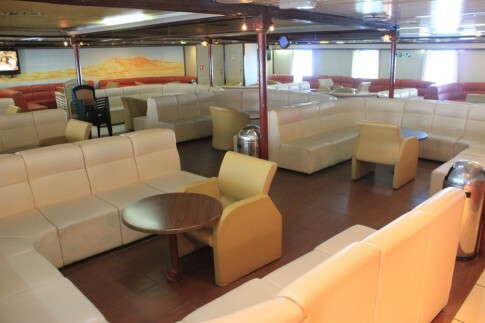 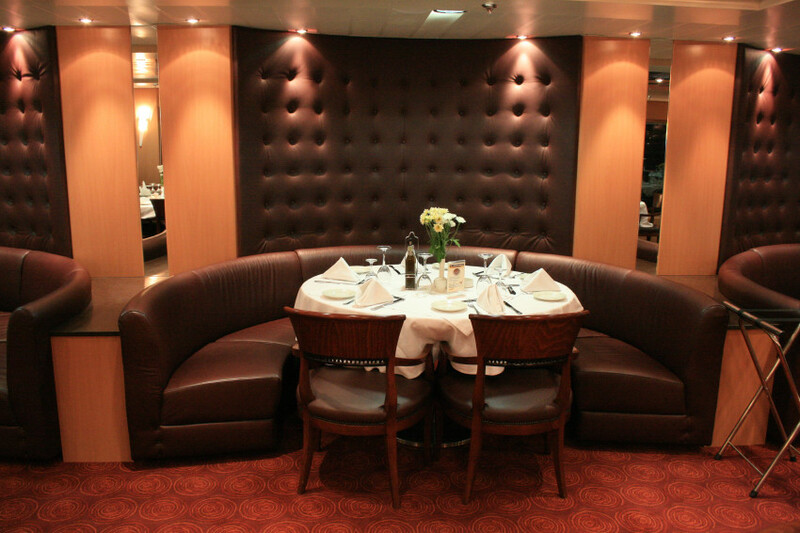 Distinguished Class lounge, forward on what is now Deck 6. 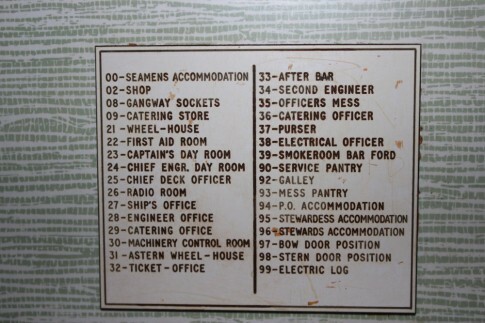 This was once the Mercia Bar with an adjacent coffee lounge. The forward staircase, still decorated by the two-deck high work by Franta Belsky, albeit now missing its Horsa centrepiece. 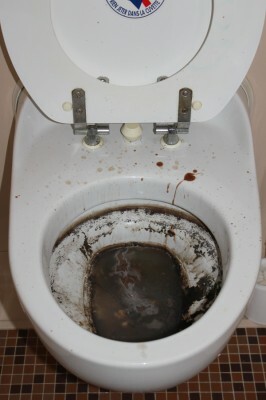 The forward lounge on Deck 5. 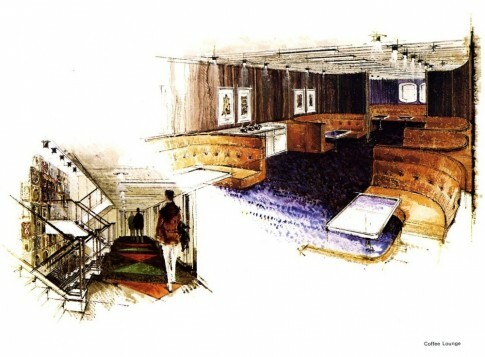 For many years in Greek service this retained most of the decor of its 1980s incarnation as the Venice Simplon Orient Express lounge, but was refitted in the mid-2000s. 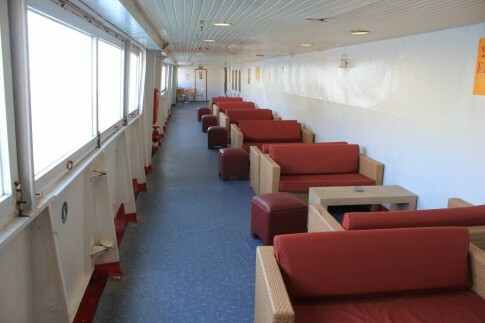 Heading aft on either side are the two side lounges, still with their original seating which was manufactured by Burgess Furniture in Feltham, Middlesex. 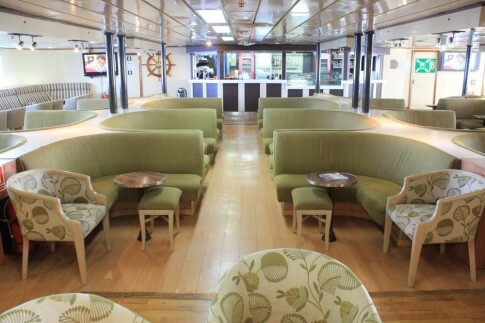 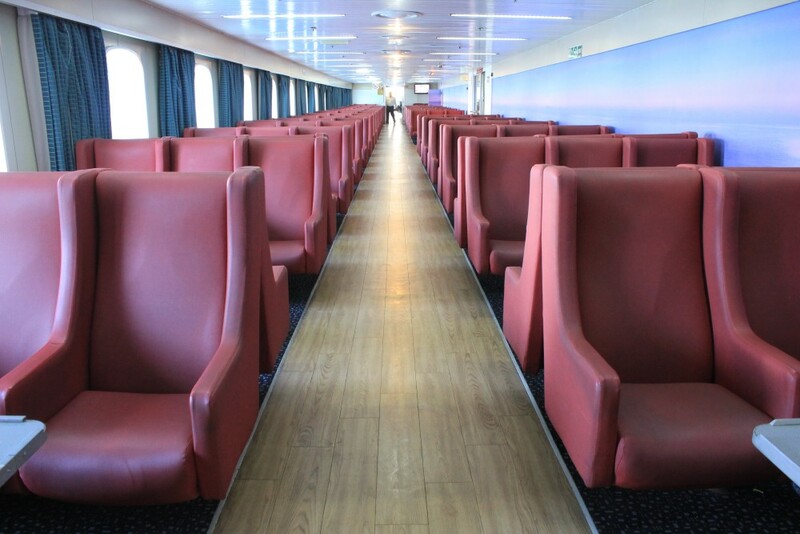 Amidships between the two side lounges which it served was what was originally called the Tea Bar, intended by British Rail to be 'more modest in conception than the other bars in order to maintain a quiet atmosphere'. Forward of the Tea Bar on the ship's centreline what was once the Duty Free shop is now an additional, windowless, area of seating. 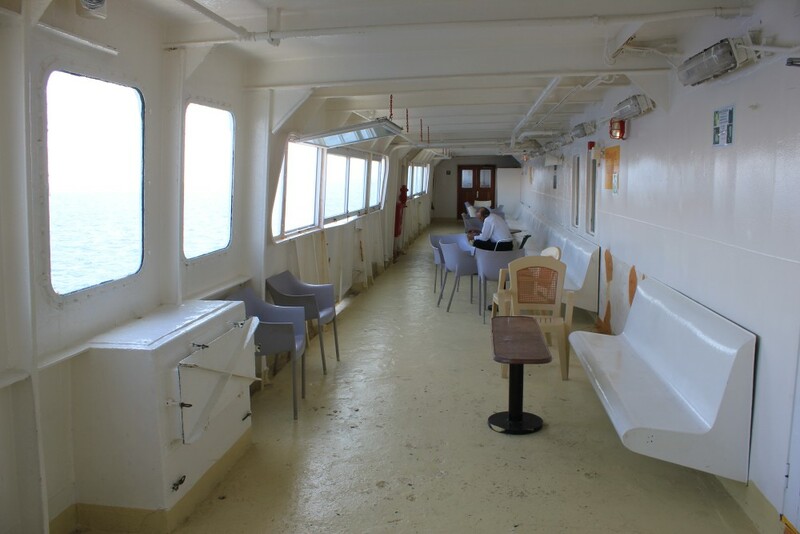 This has inherited some of the generic chairs (made by Primo in London) which were installed in the cafeteria upstairs during the late 1980s. 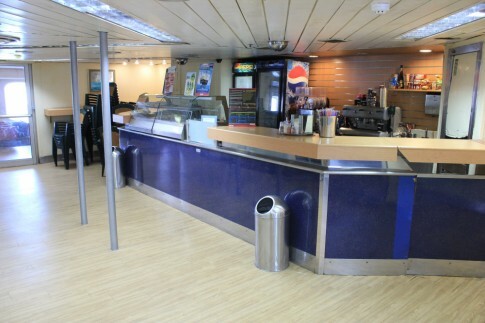 The aft lobby with two different reception desks. 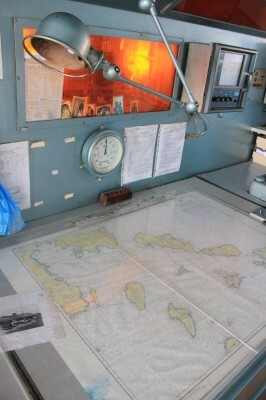 In the foreground left behind the current mirrored panel was originally the passport office, to the right the bureau de change and far left the Purser's desk. 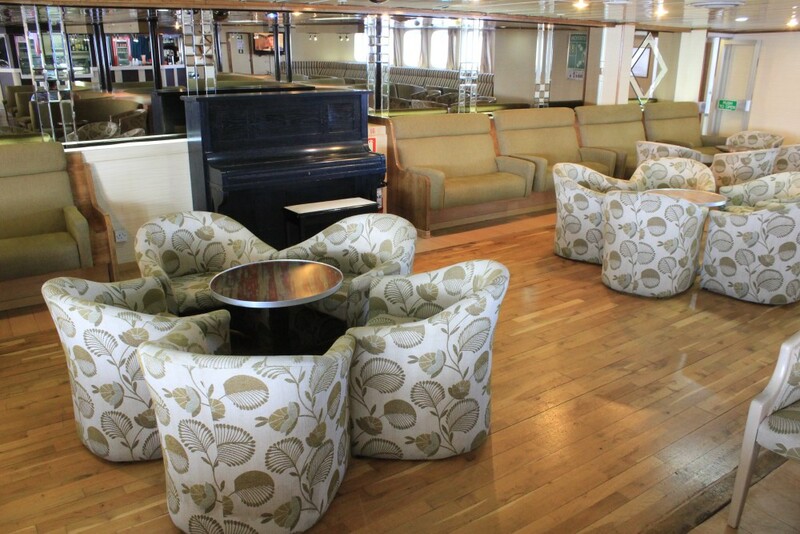 Still retaining its original Burgess seating is the aft lounge, originally a non-smoking saloon. 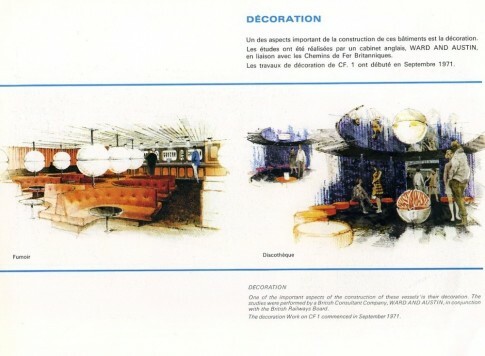 The area of the original discotheque, to the right of this image, has been absorbed into the lounge. 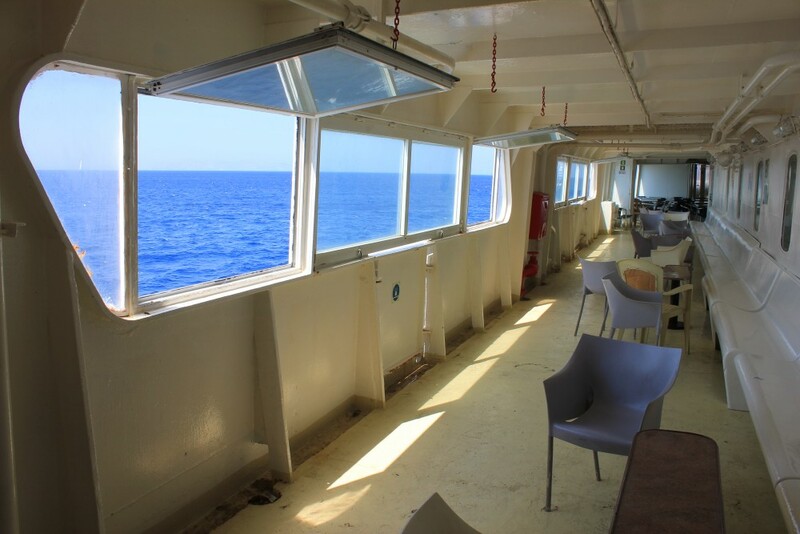 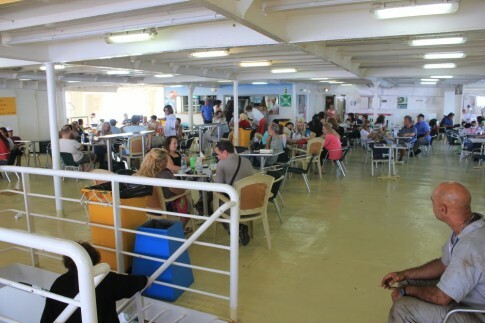 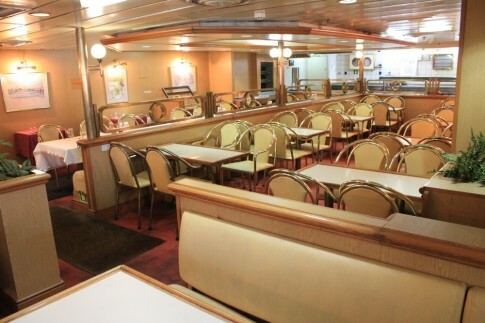 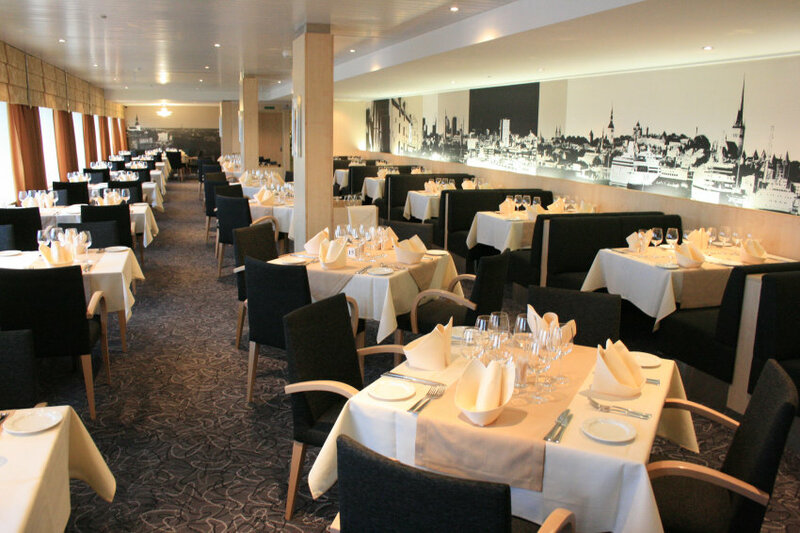 Moving back upstairs, this is the cafeteria, rarely used as such during the ship's second stint in Agoudimos service when it was only generally opened up on busy sailings as an additional seating area. 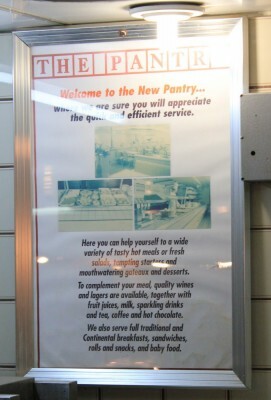 ...and still promises a 'full traditional breakfast'. 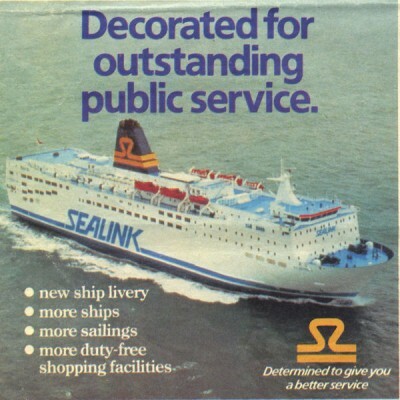 Even Sammy Sealink has somehow managed to survive over 20 years in Greece. 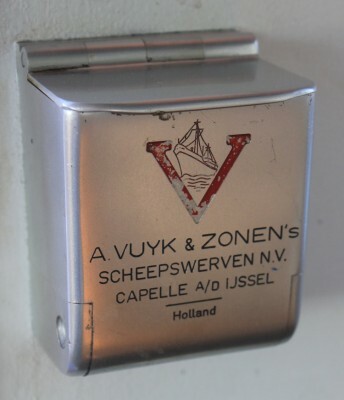 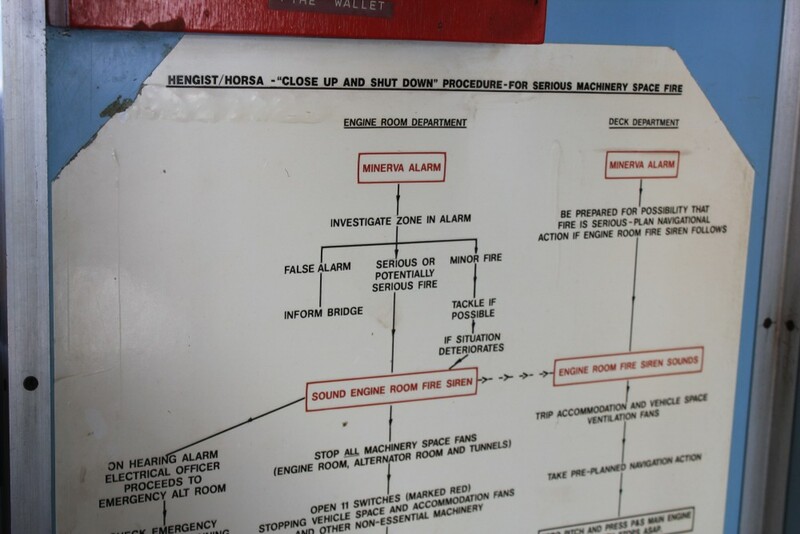 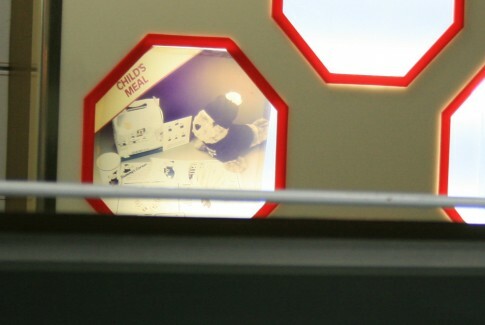 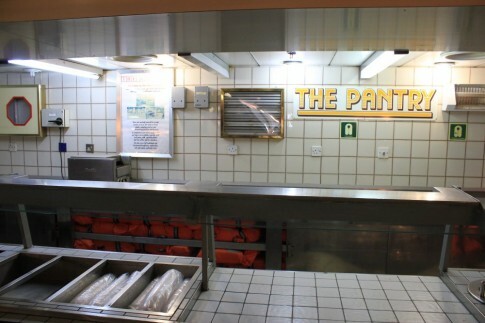 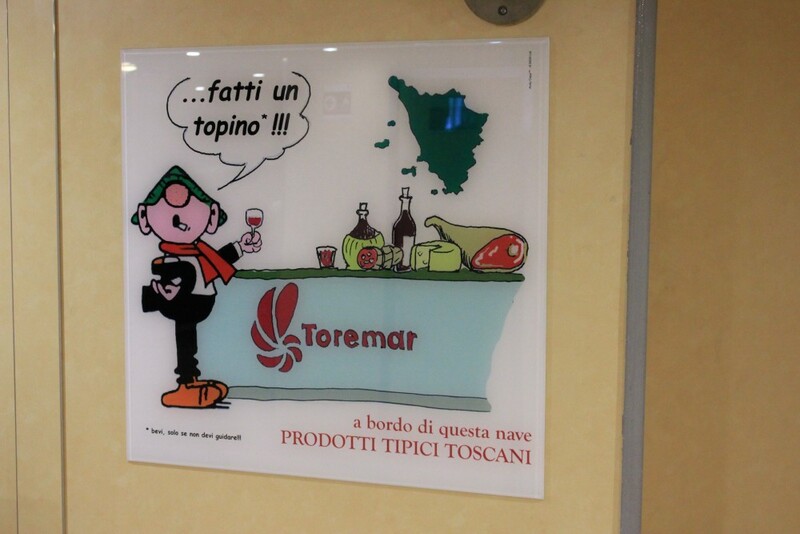 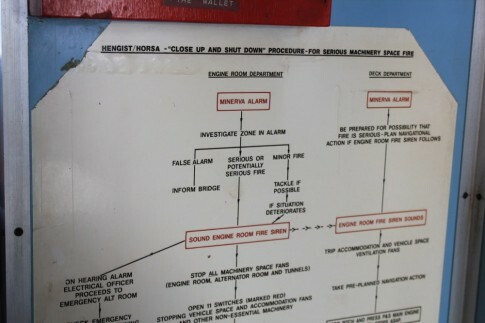 A corner of the ship's galley. 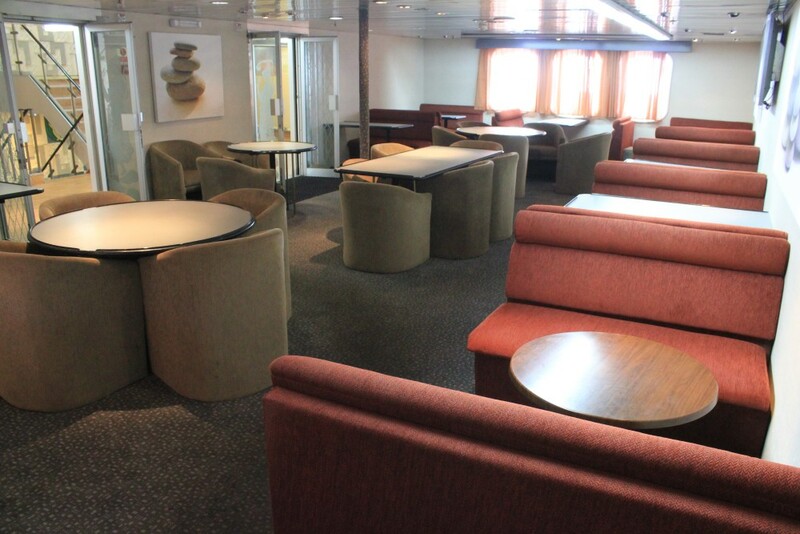 Concluding our tour of the interior accommodation this secondary Distinguished Class lounge, forward of the galley, was originally the ship's 48-seat restaurant. 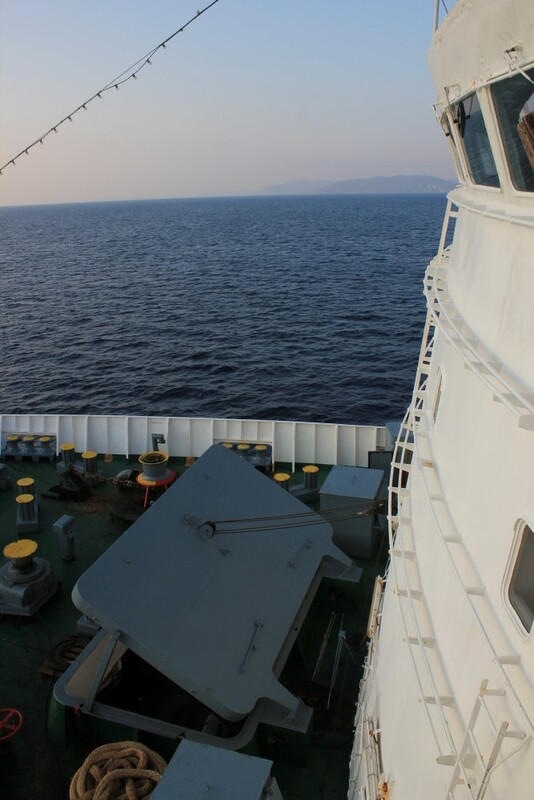 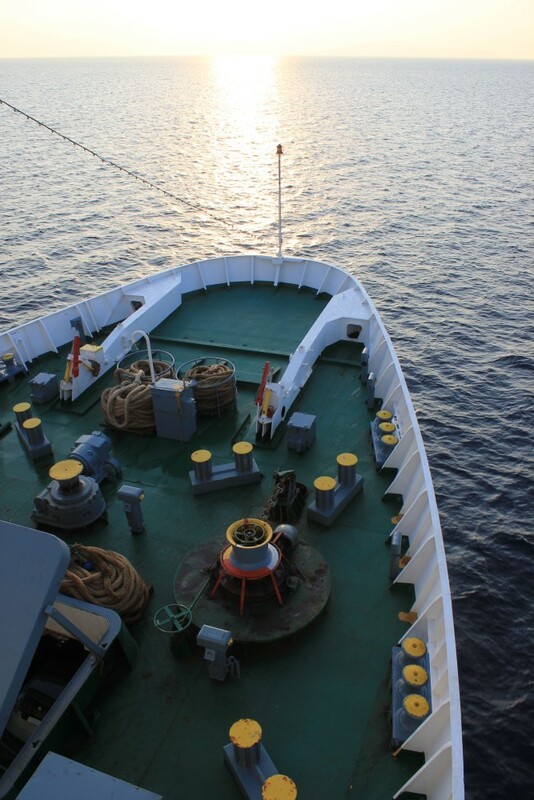 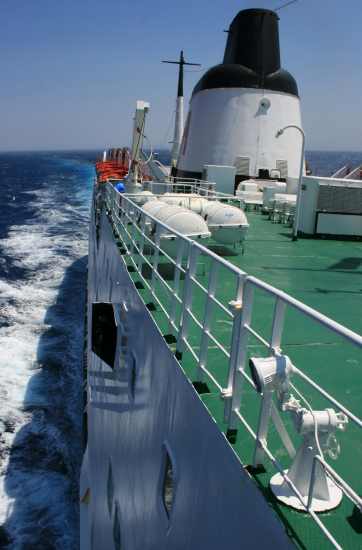 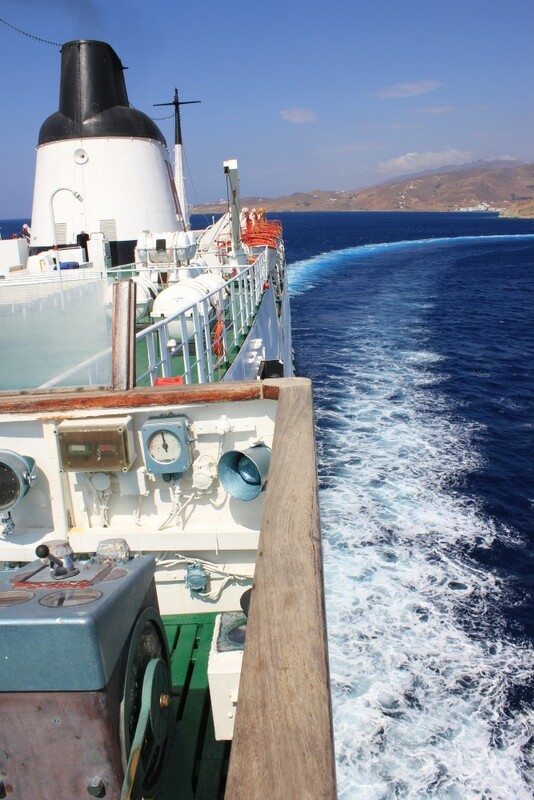 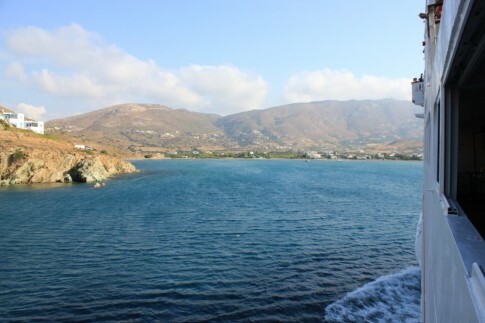 Back outside, the ship is now approaching Andros. 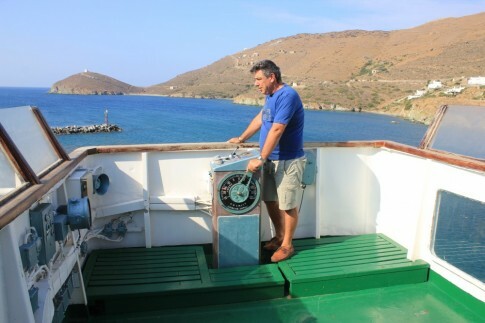 Captain Costas Velalopoulos, master of the Penelope A from 2004 until 2013. 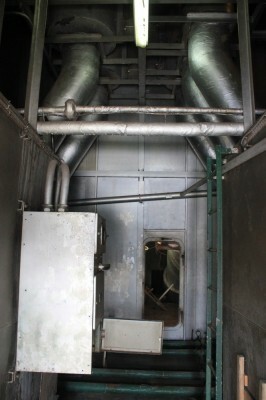 The cathedral-like innards of the ship's giant funnel. 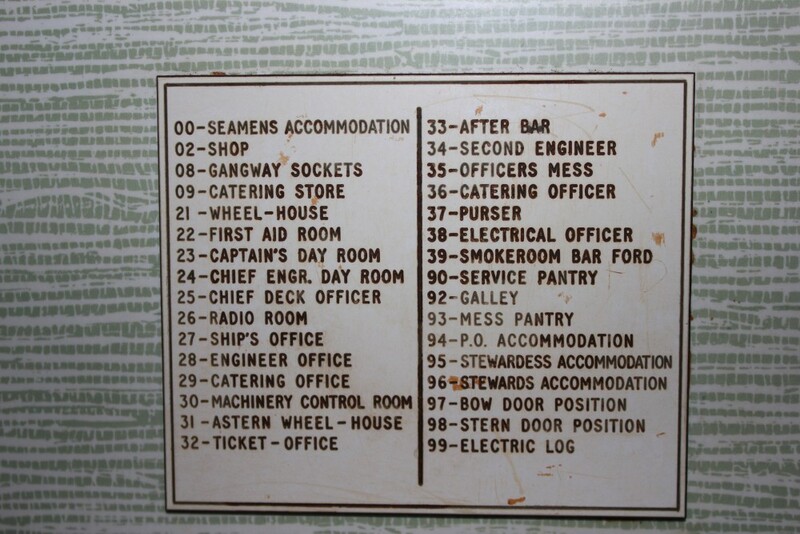 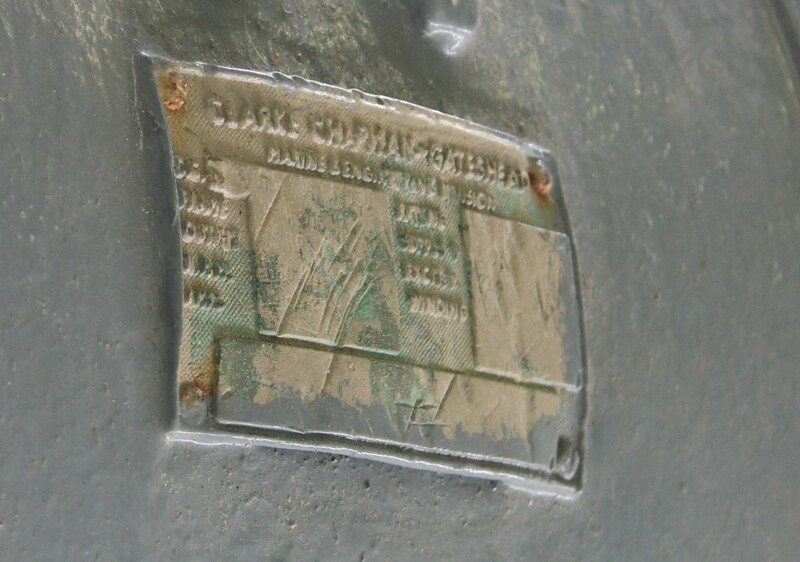 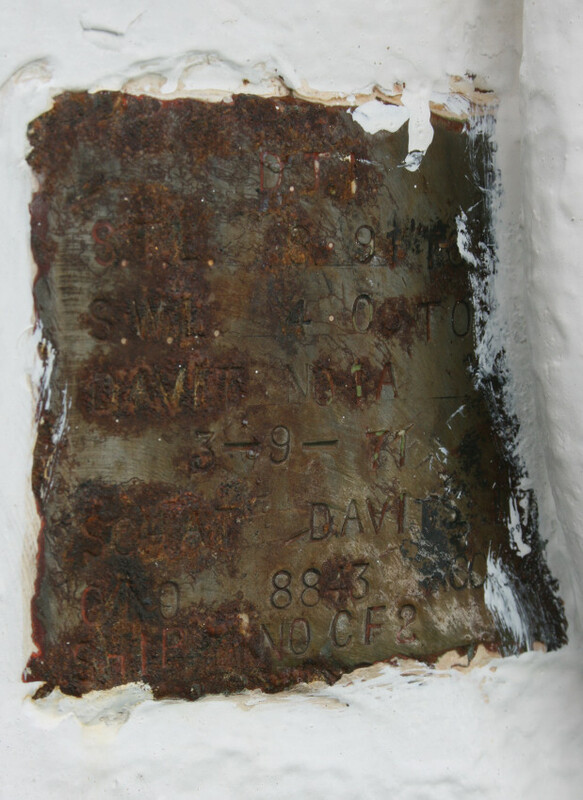 Most of the ship's lifeboat davits retained their small installation plates detailing test date (in this case 3rd September 1971) and the ship's yard number, CF2 (Hengist being CF1 and later sister Senlac CF3). 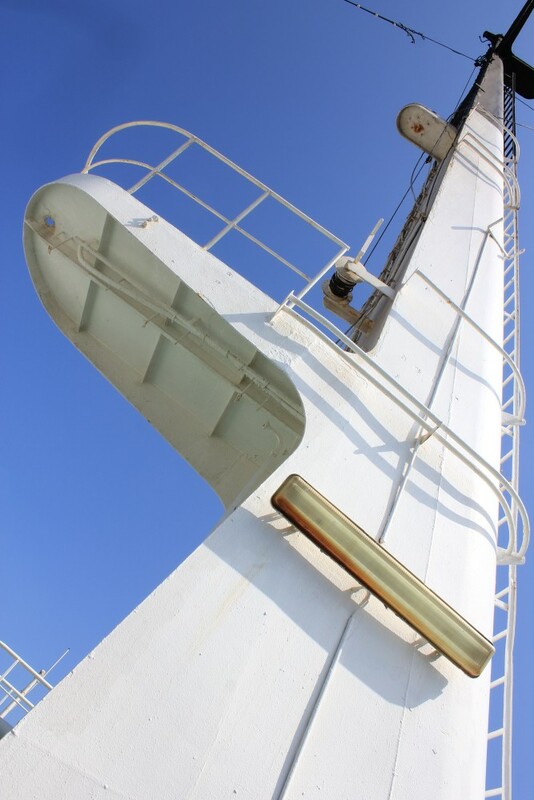 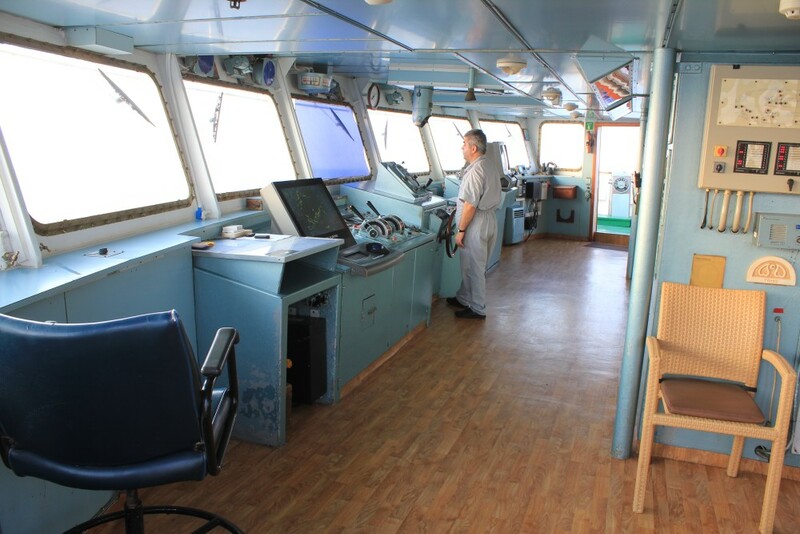 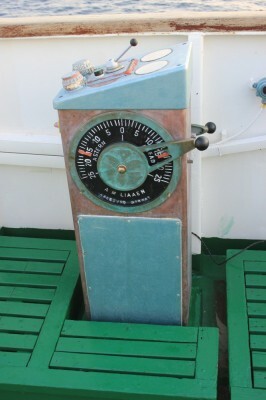 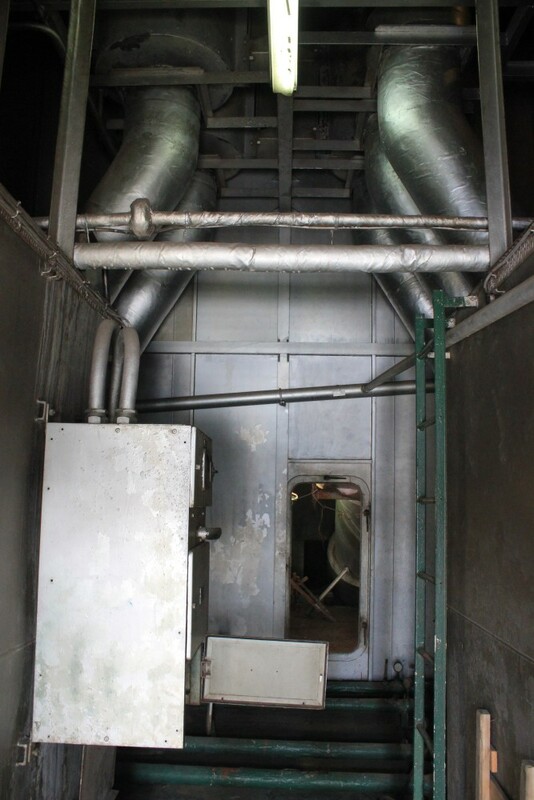 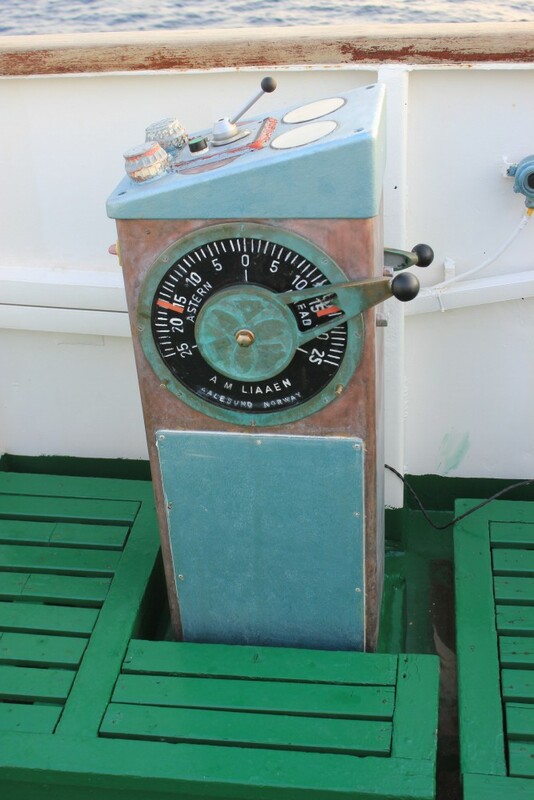 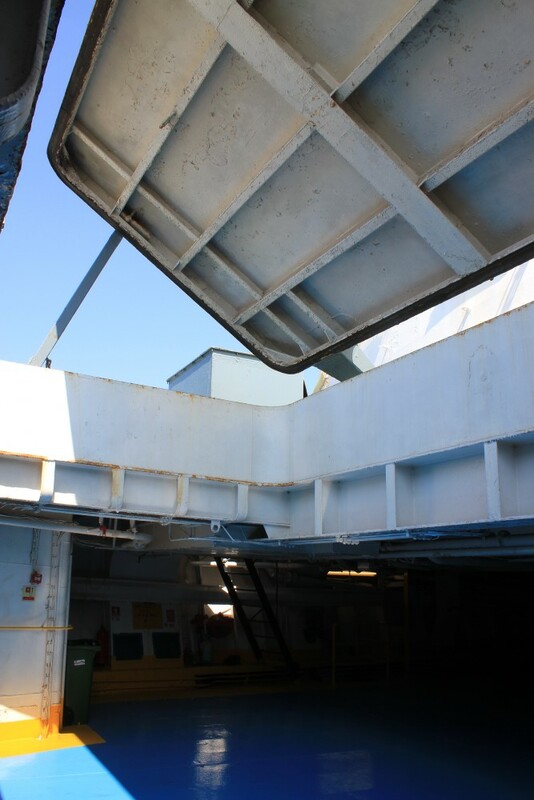 Aft deck machinery - supplied by Clarke Chapman in Gateshead. 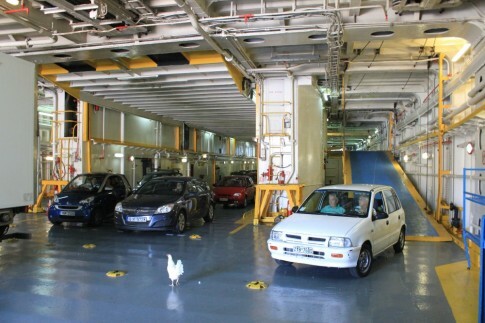 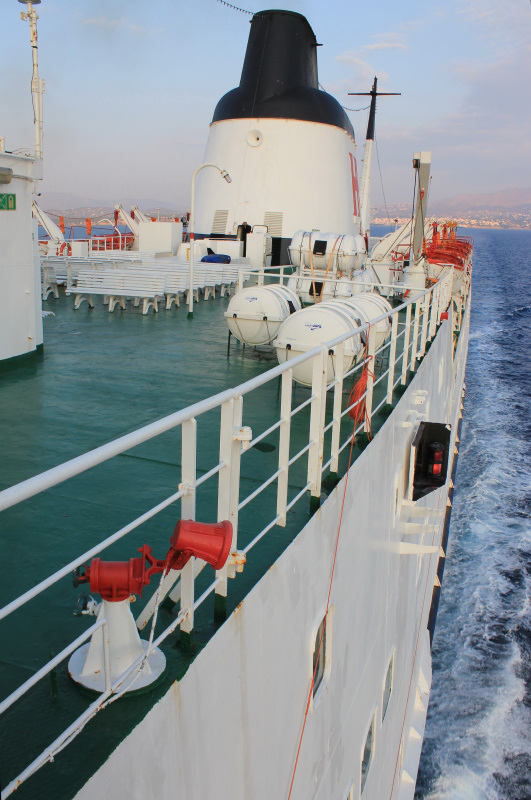 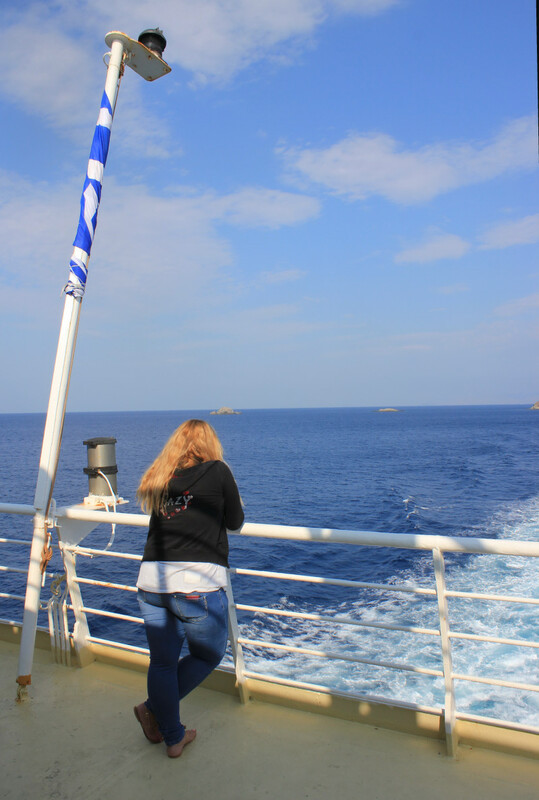 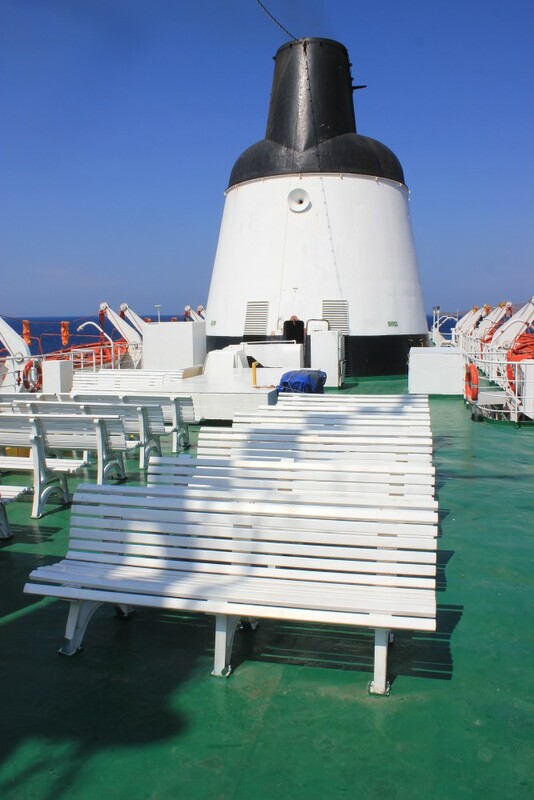 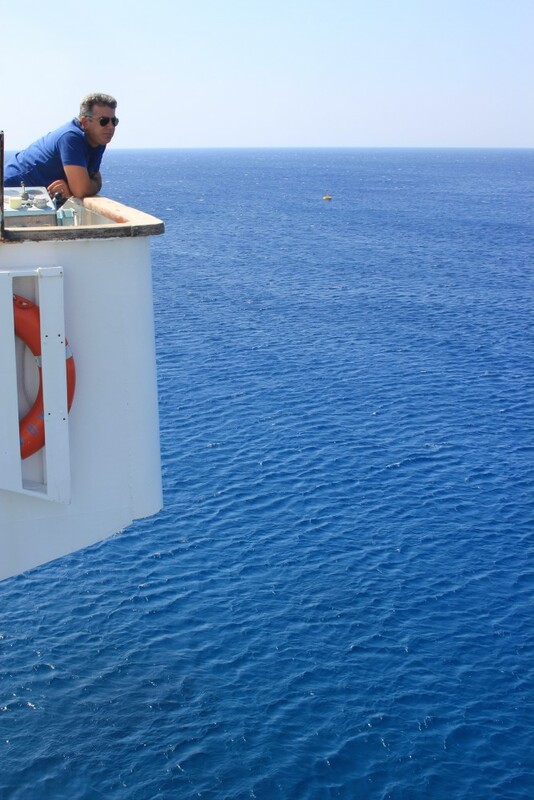 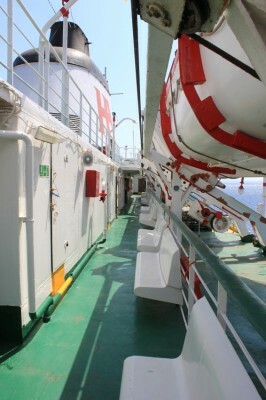 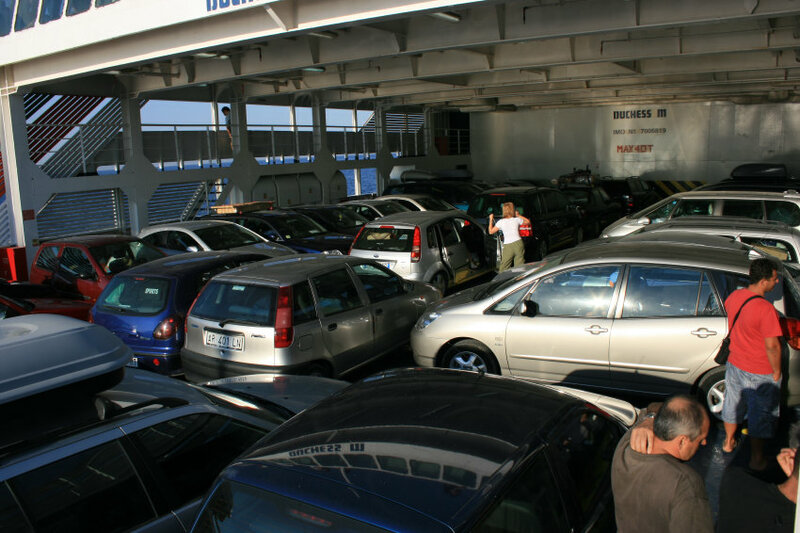 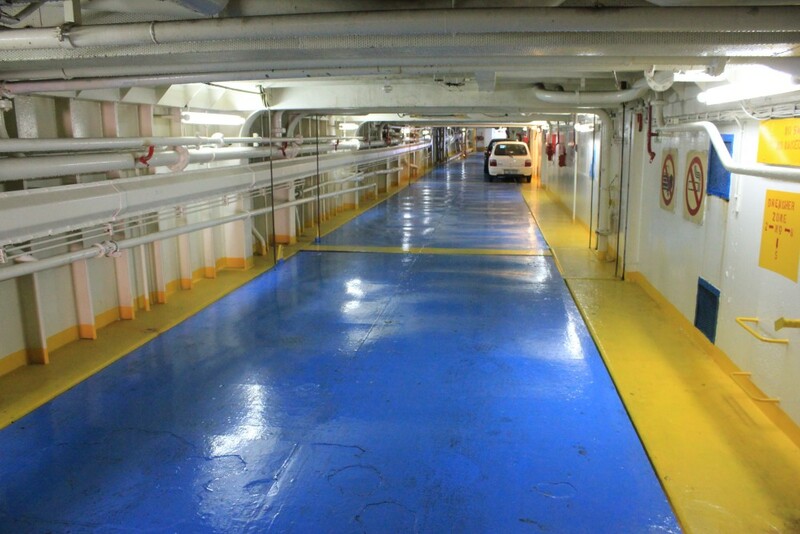 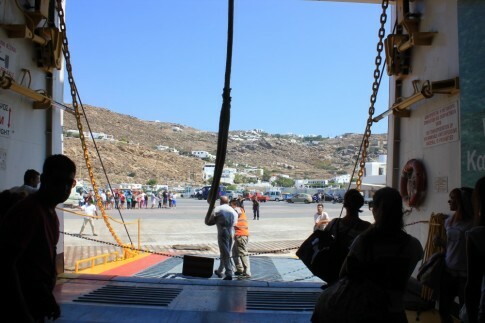 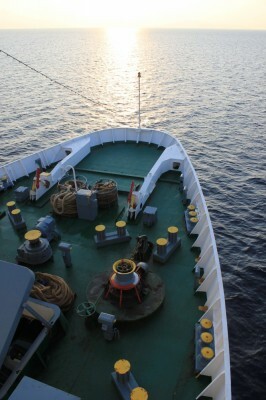 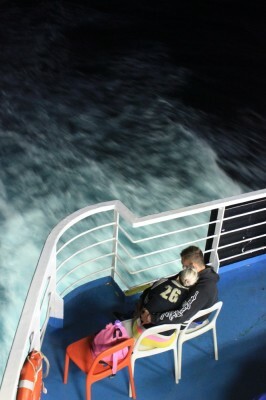 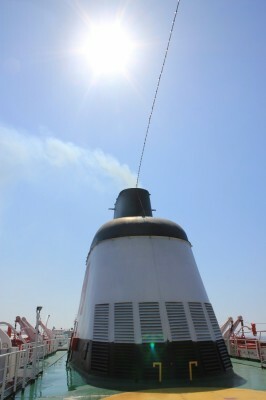 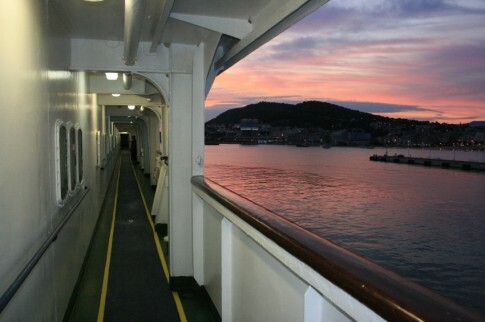 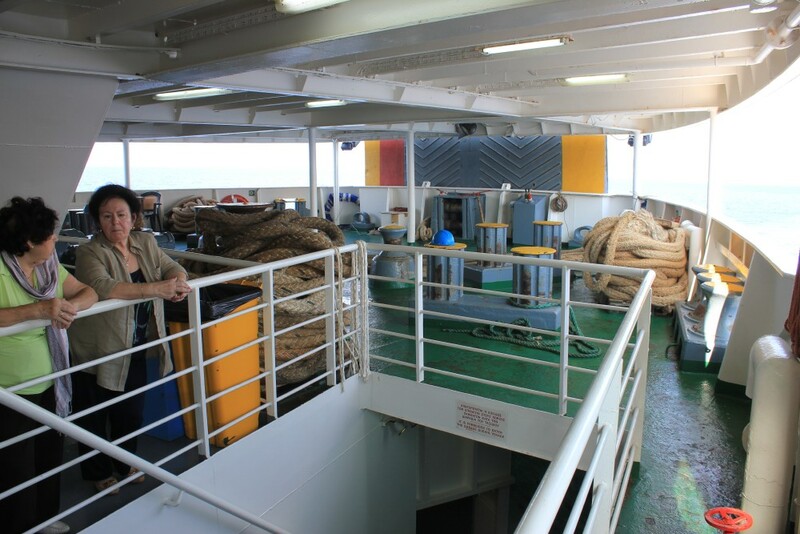 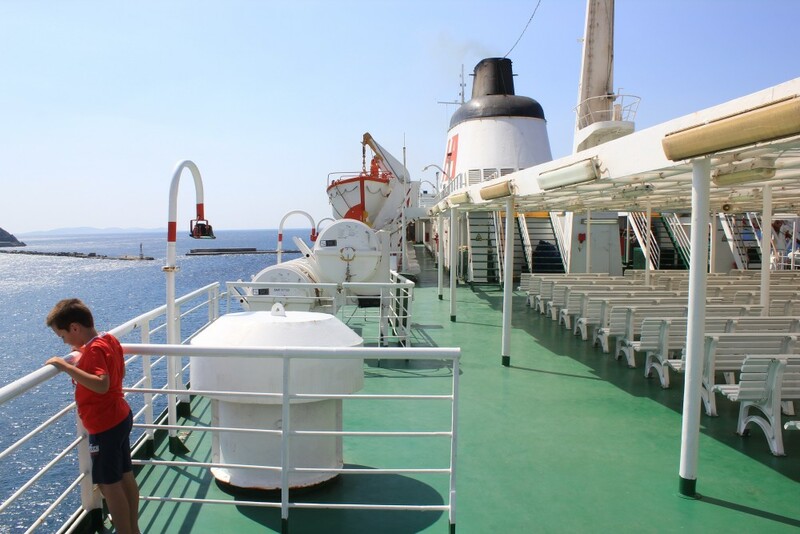 As we approach Tinos, there's time for a quick look down on the car deck. 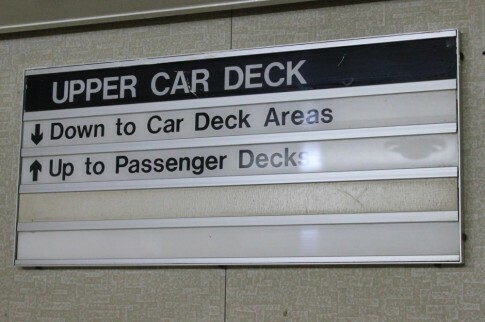 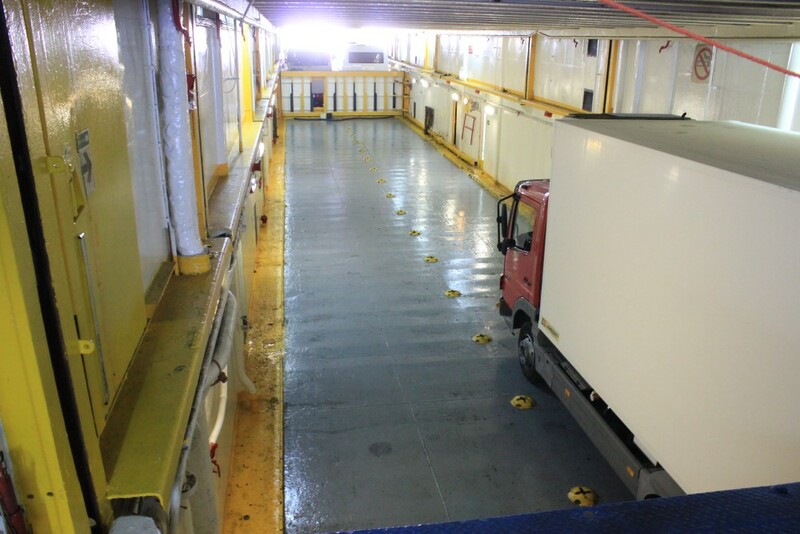 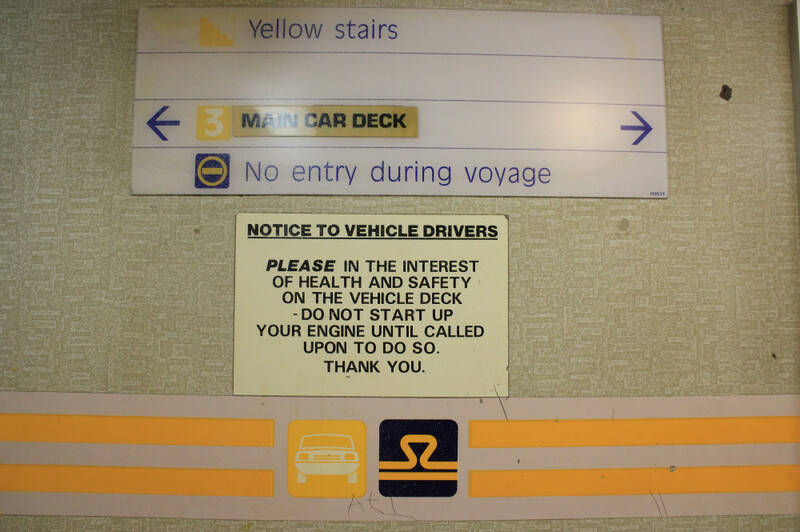 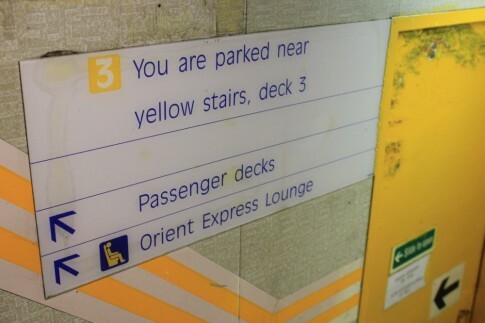 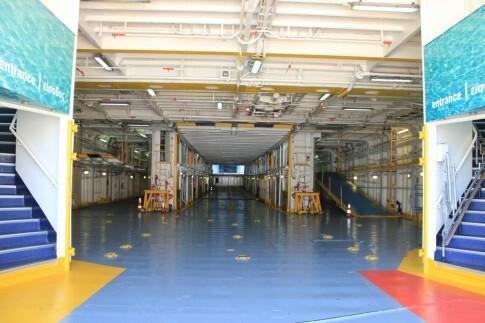 One of the upper mezzanine sections of the vehicle deck - as built, this was designed to accommodate two cars side by side. 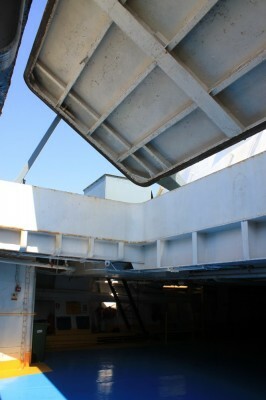 The vehicle deck hatch, forward, was often open during the ship's final years as the Penelope A. ... just like this one (picture from 1987). Between 1974 and 1985 the Prince Laurent was a Sealink fleetmate; for 20 years after 1993 the two ships operated in constant direct competition out of Rafina. 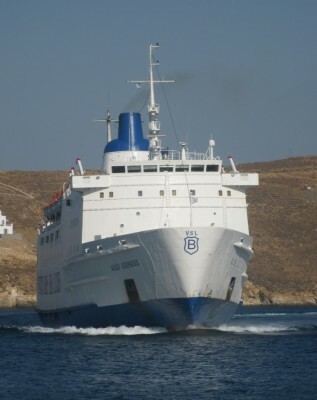 The former 'Laurent', now the Superferry II, is seen approaching Tinos. 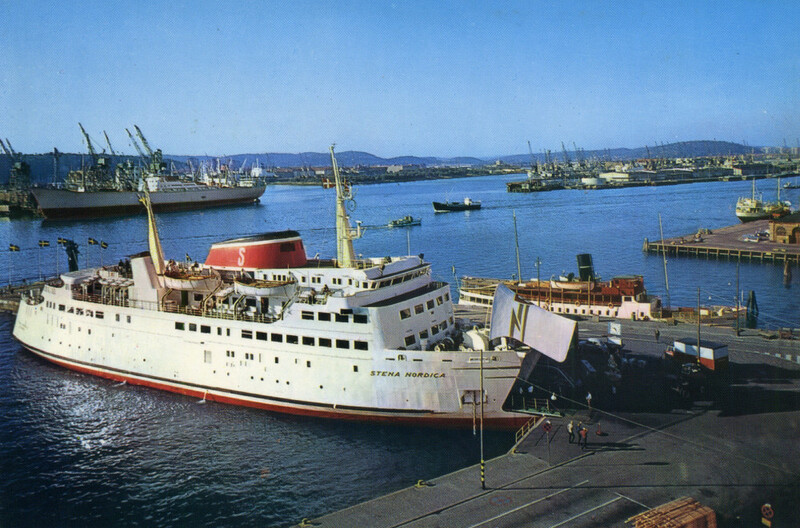 Superferry II backing onto her berth, the painted-over RMT monogram can still be seen, welded to her funnel. Arrival at Mykonos new port. 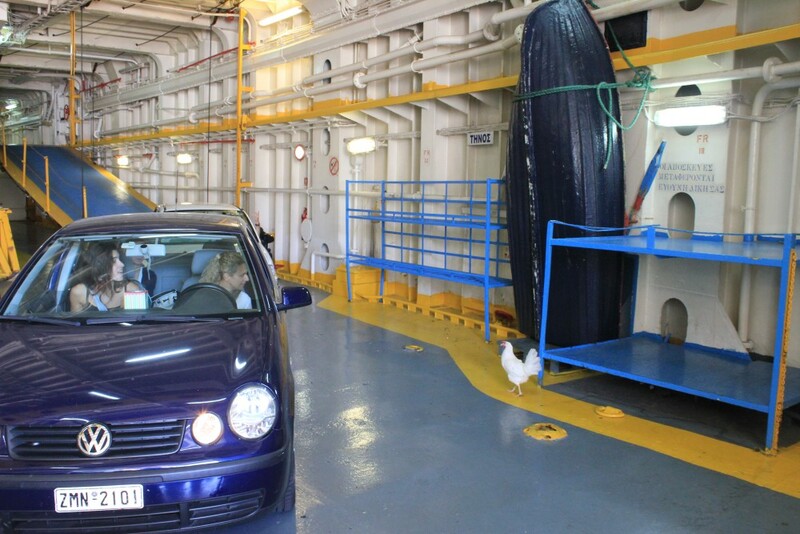 Is somebody missing a chicken? After holding up trafic for a few minutes, the chicken was last seen being strung up by one of the crew members, very possibly en-route to the galley. 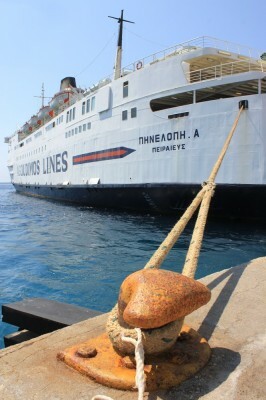 Secure on the berth at Mykonos. 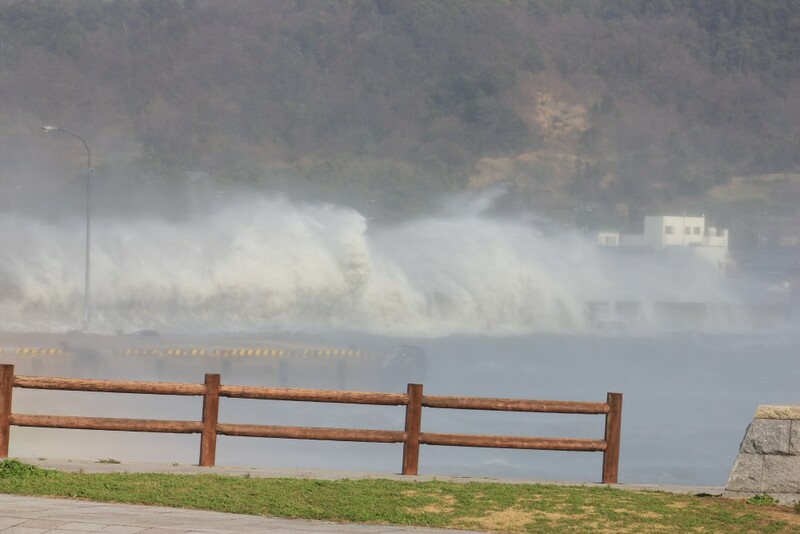 Just four days later the ship would make her final sailings. 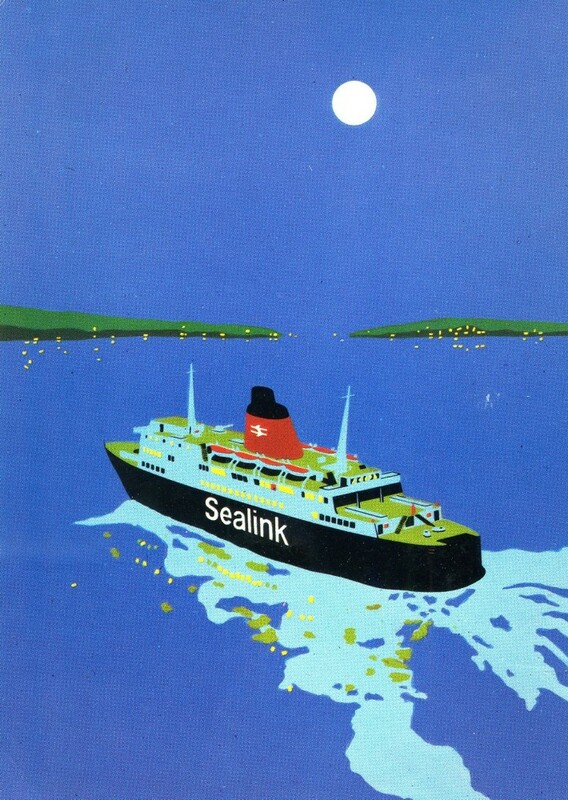 29 April 2012 marks 40 years to the day since the launch of Sealink’s Hengist and Horsa, the purpose-built ferries delivered in the summer of 1972 by the naval shipyard in Brest. 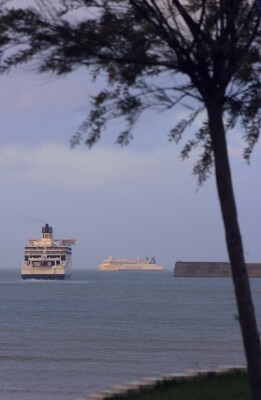 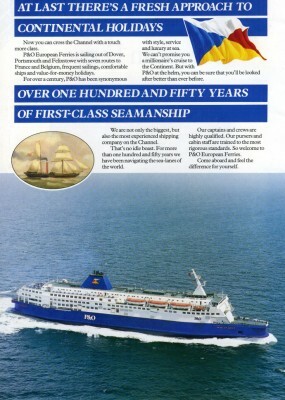 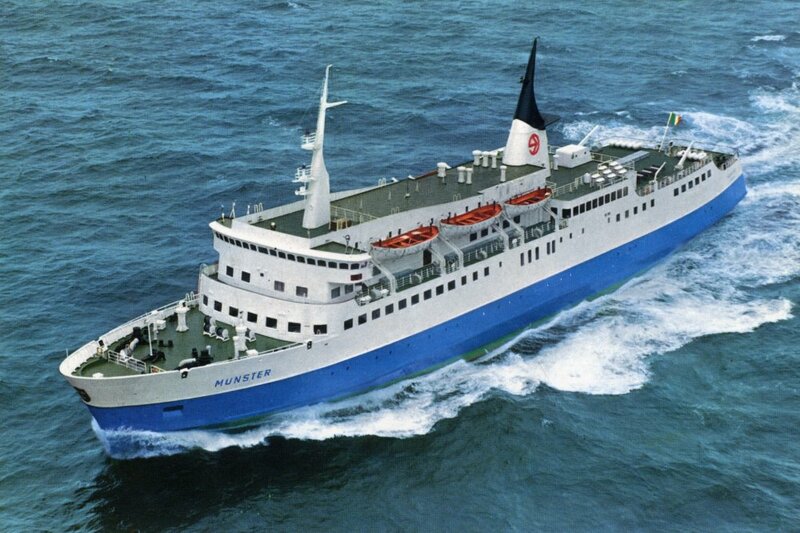 The sister ships saw service, primarily from their Folkestone home, until the final closure of the Folkestone-Boulogne route at the end of 1991. Thereafter, both forged remarkably successful new careers in the Aegean, where they remain in year-round operation as the Agios Georgios (Ventouris Sea Lines) and Penelope A (Agoudimos Lines). 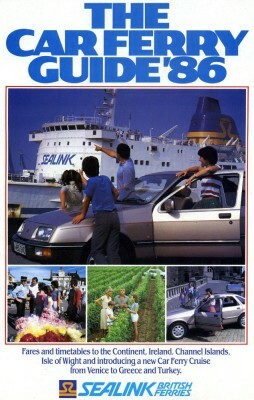 A third, slightly modified, later sister, the Senlac, was scrapped in 2010. 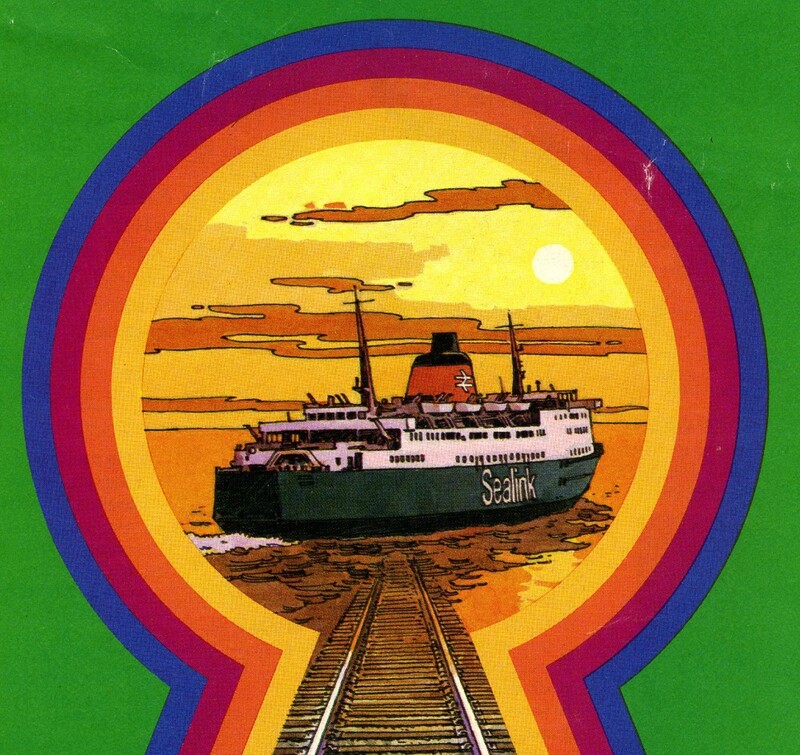 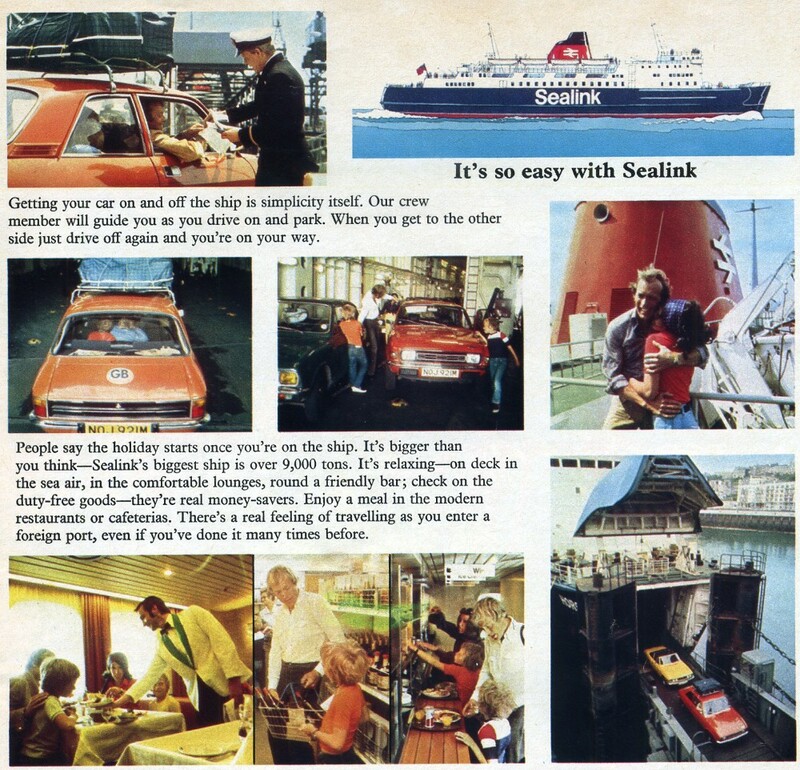 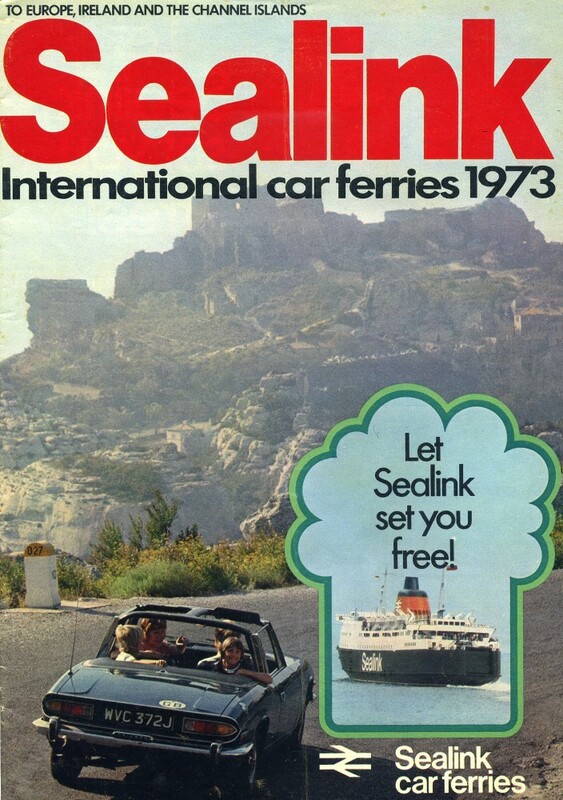 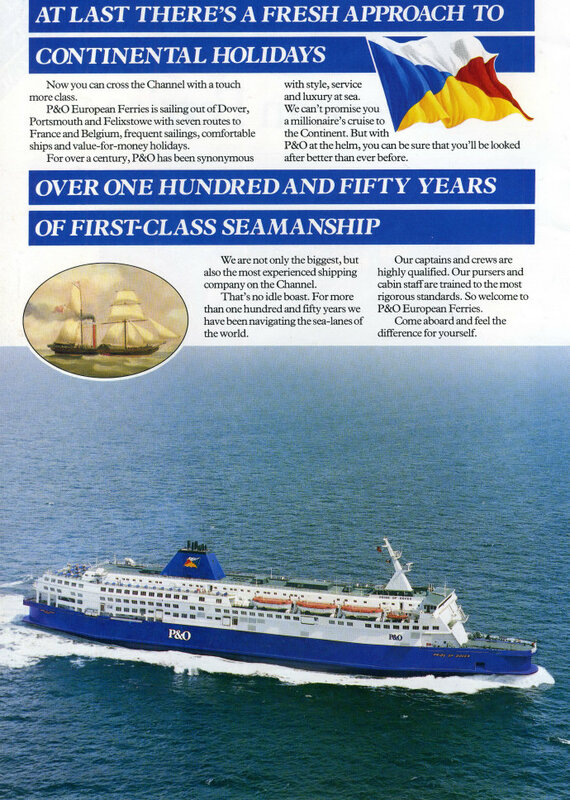 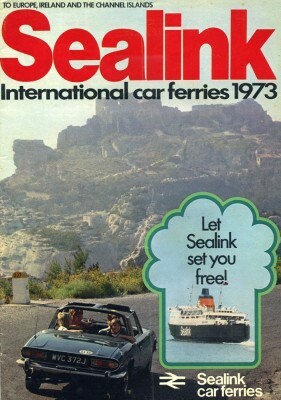 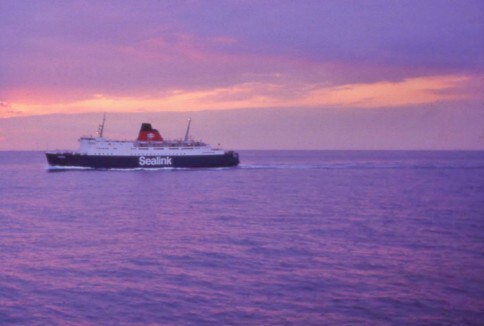 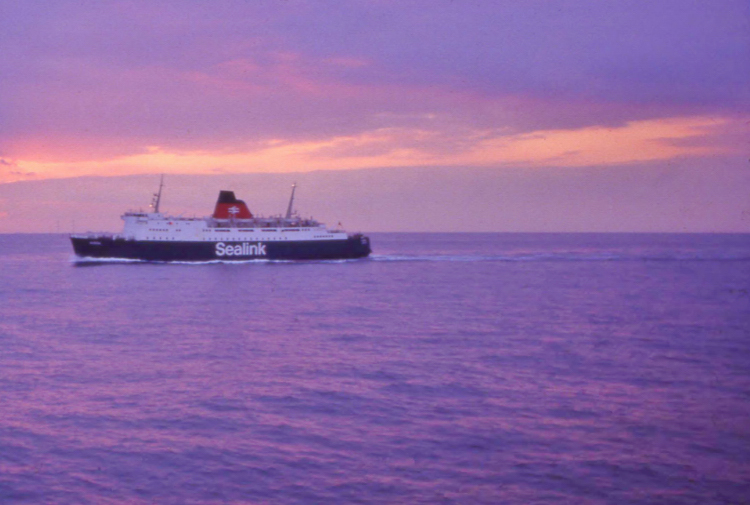 In this entry we take a look back at the ships’ British careers through Sealink promotional material produced over their near two decades of service. 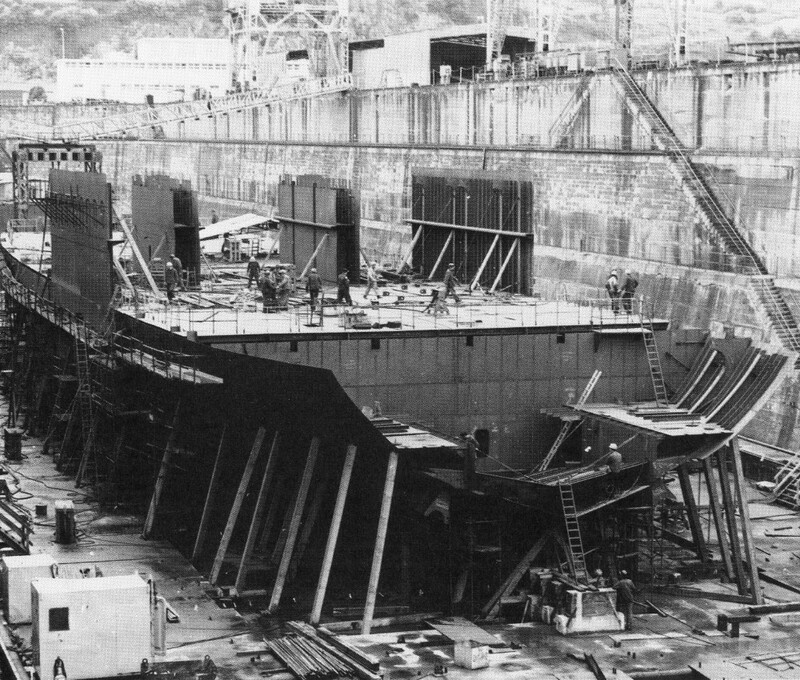 The building dock in Brest showing the lower hull of the Hengist. 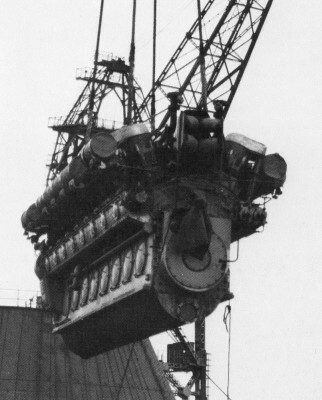 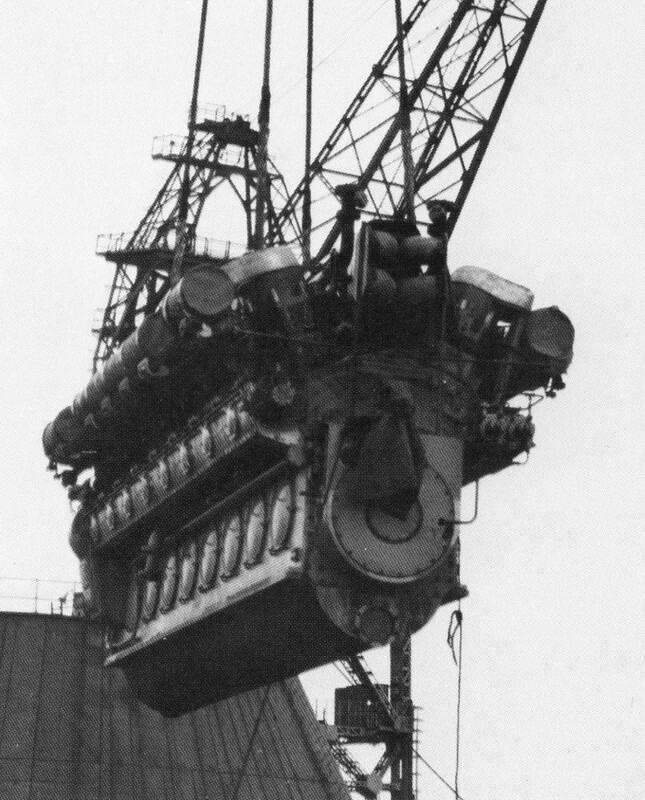 One of the SEMT-Pielstick main engines is craned into place. 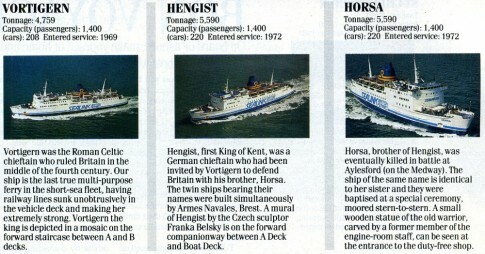 The Horsa (left) and Hengist. 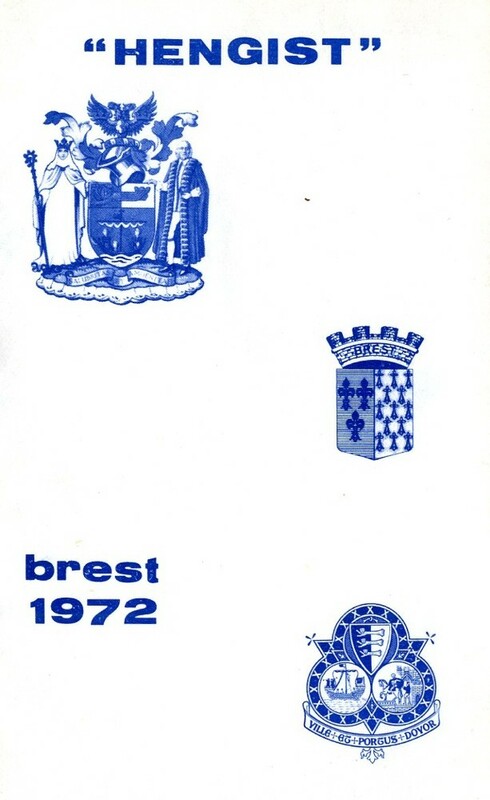 The cover of the shipyard's brochure commemorating the Hengist, Horsa and Senlac. Cover of a menu for lunch and dinner as served on the Hengist's three-day trials. Main courses included 'Cabillaud Ã la Portugaise' and 'Jambon braisÃ© Ã la Florentine'. 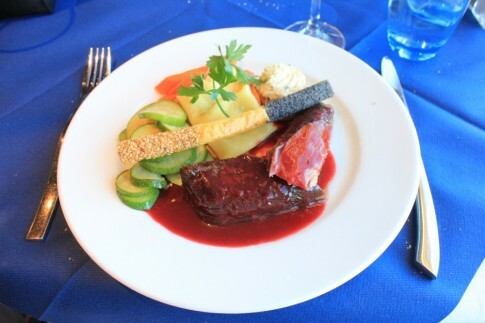 The equivalent for the Horsa: 'Poulet Ã l'AmÃ©ricaine' and 'CÃ´te de porc sautÃ©e' were the highlights. 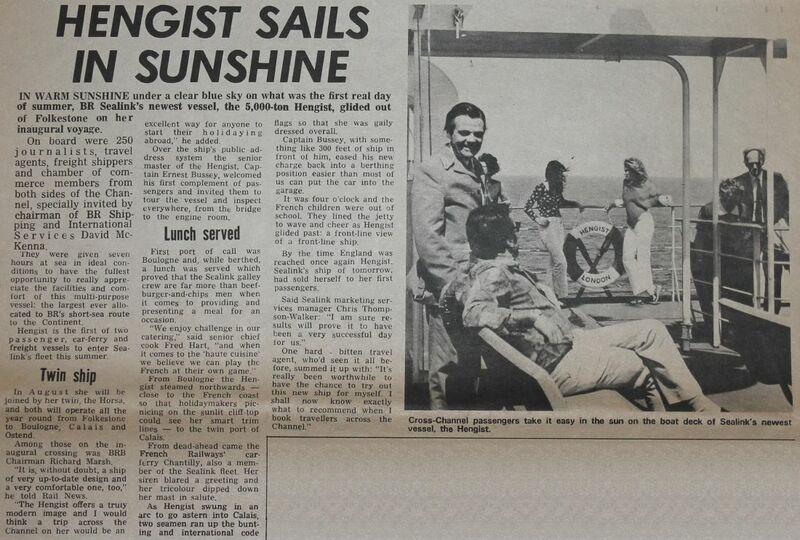 Contemporary coverage of the Hengist's press voyage. 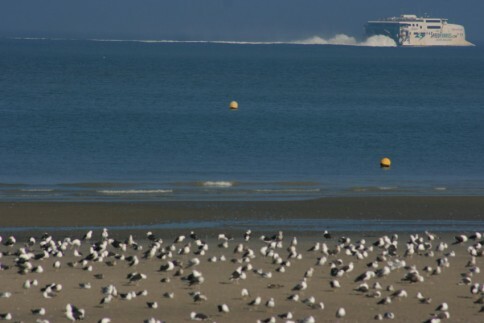 The Horsa arriving at Boulogne. An aerial view of the car ferry terminal at Folkestone, with one of the sisters on the berth. 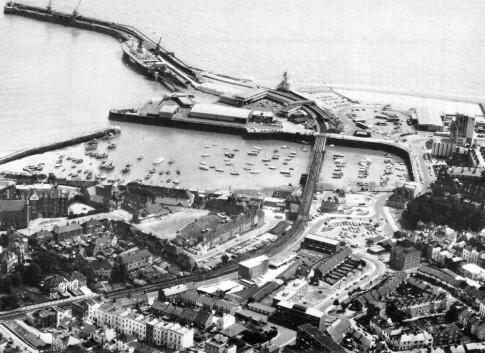 This image dates from after the construction of the first section of the Hotel Burstin (the tall white building on the far right) in 1974/75 but before the demolition of the frontage of its predecessor, the old Royal Pavilion hotel, in whose grounds the rather brutal 'Burstin' had been built. 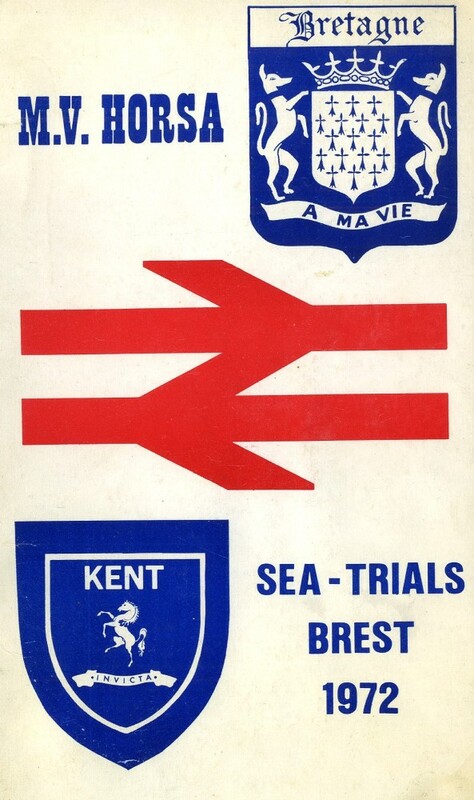 The introduction of the Hengist and Horsa also saw the start of freight runs from Folkestone to Oostende. 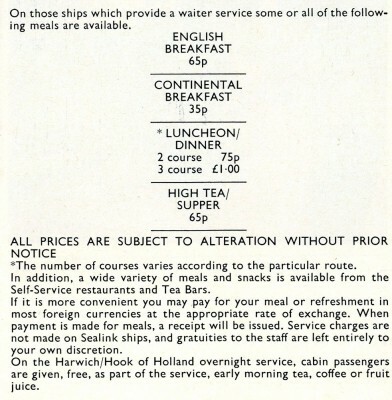 The standard Sealink restaurant menu for continental traffic in 1972 - as served in the A Deck restaurant when the Hengist and Horsa entered service. A photoreport of a trip on the Horsa in the 1975 Sealink brochure. 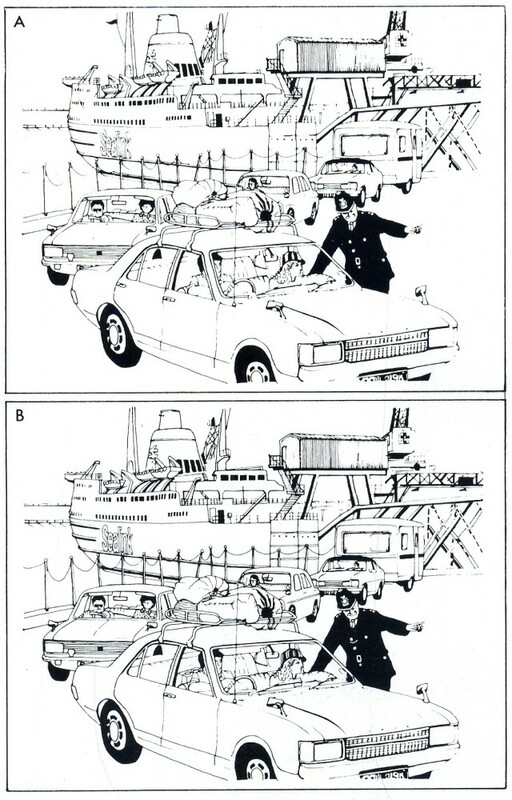 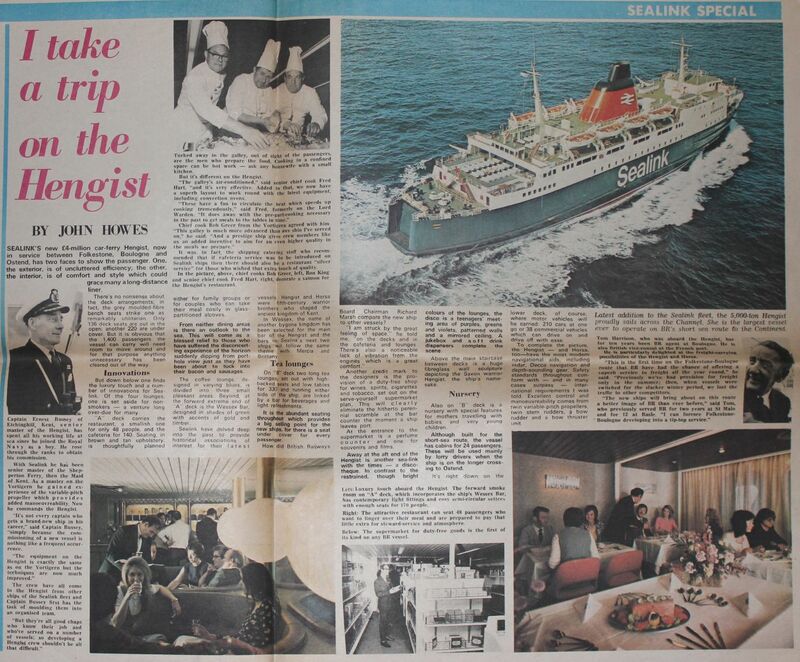 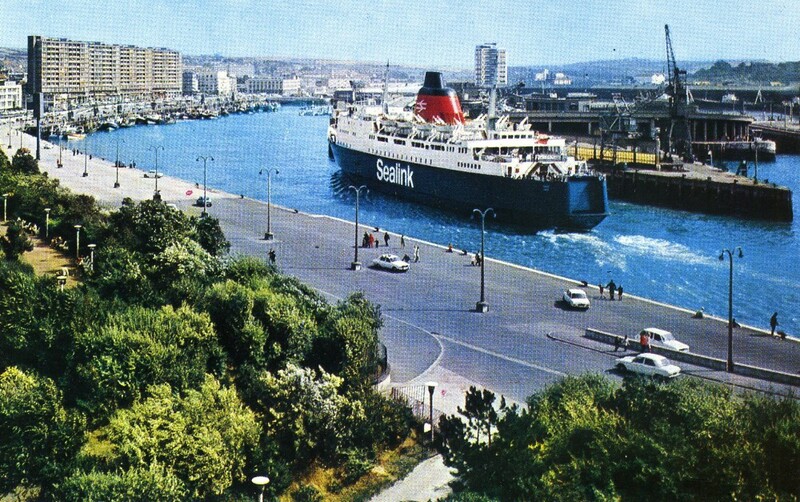 The ships starred in a spot the difference competition run by Sealink in regional newspapers in 1979 - nearly 30,000 people entered. 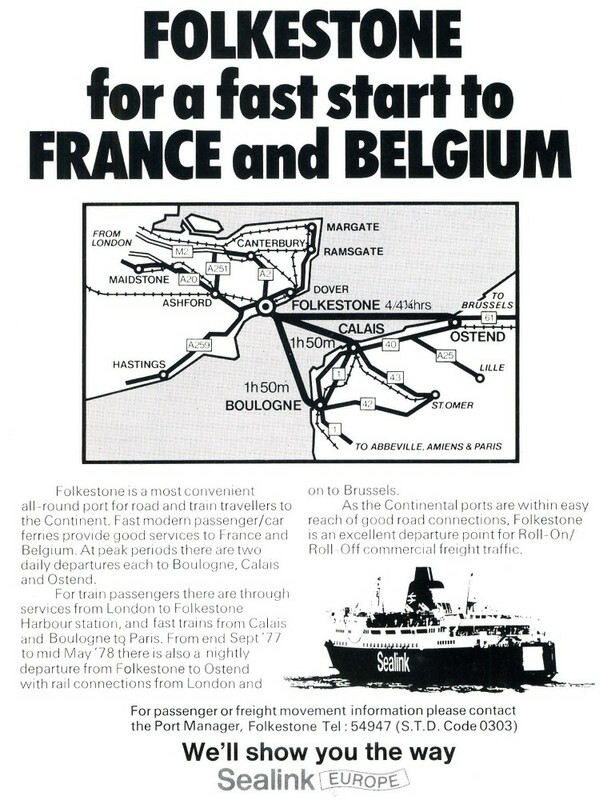 By 1986, the Folkestone-Calais and Folkestone-Oostende links had ceased and Folkestone was left with sailings only to Boulogne. The Hengist and Horsa, now in white Sealink British Ferries livery, were paired with the Vortigern until that ship's sale in early 1988. One final high profile appearance in marketing material was this image of the Horsa on the cover of early editions of the 1986 Sealink brochure. 1991 Folkestone-Boulogne ferry guide - the route closed at the end of the year. 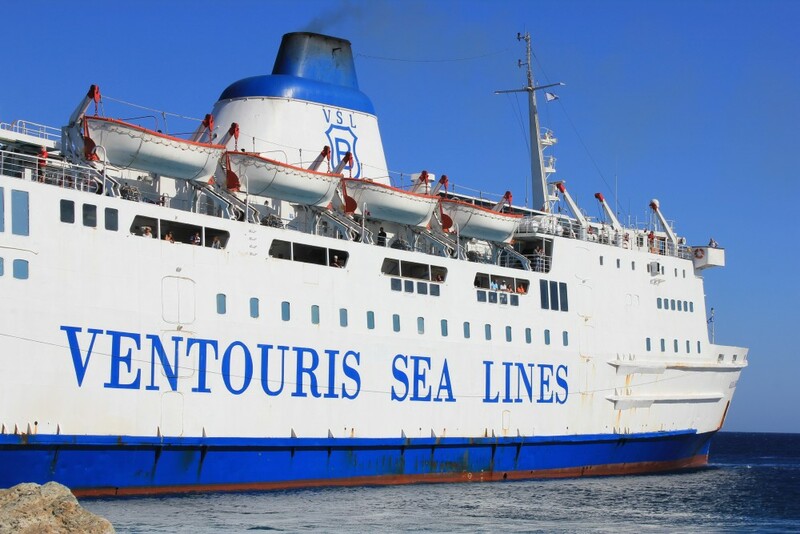 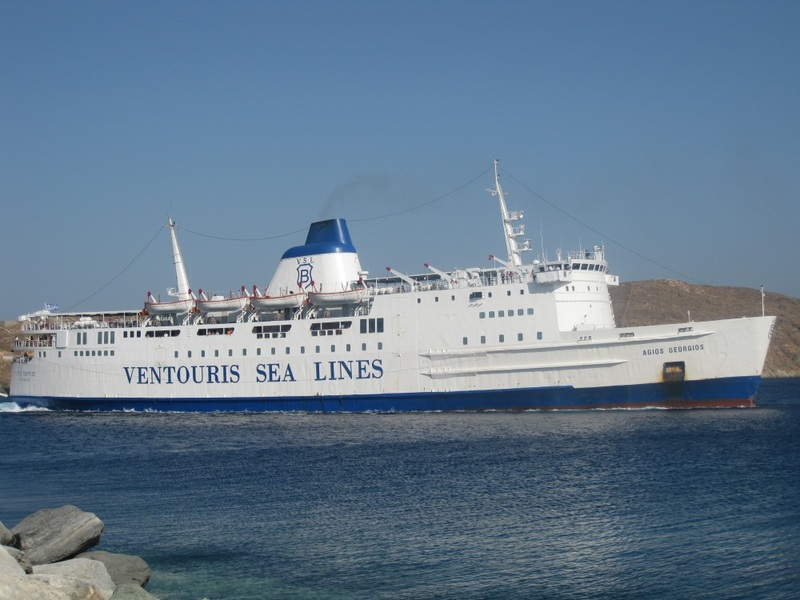 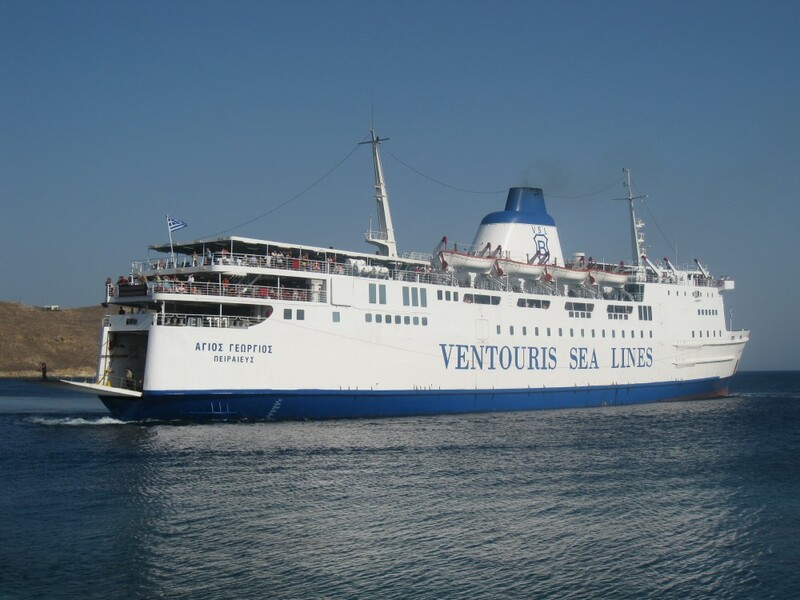 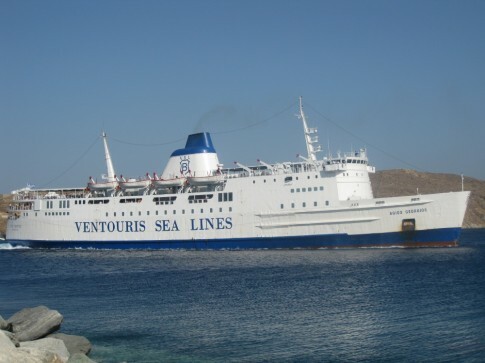 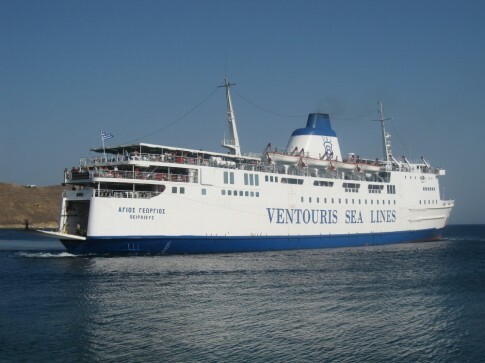 Although Ventouris Sea Lines’ unprepossessing website gives little away, the Agios Georgios (ex-Hengist) remains the key conventional ship on operations from Piraeus to the Western Cyclades. 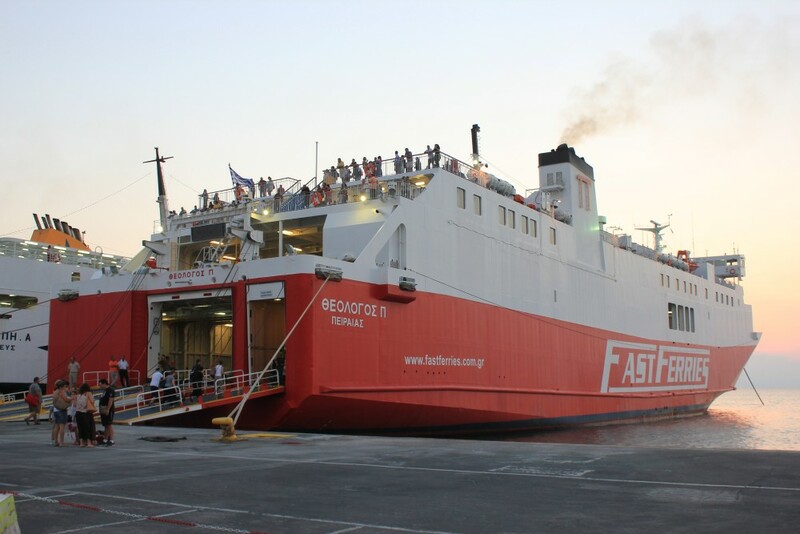 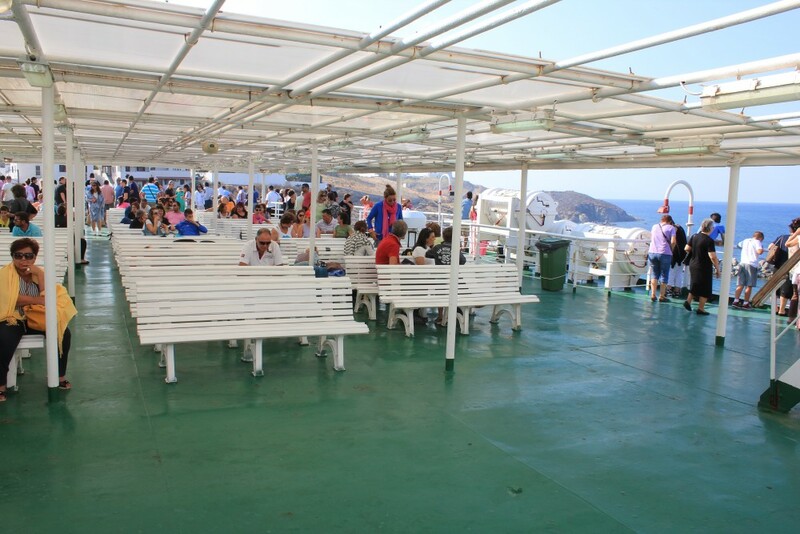 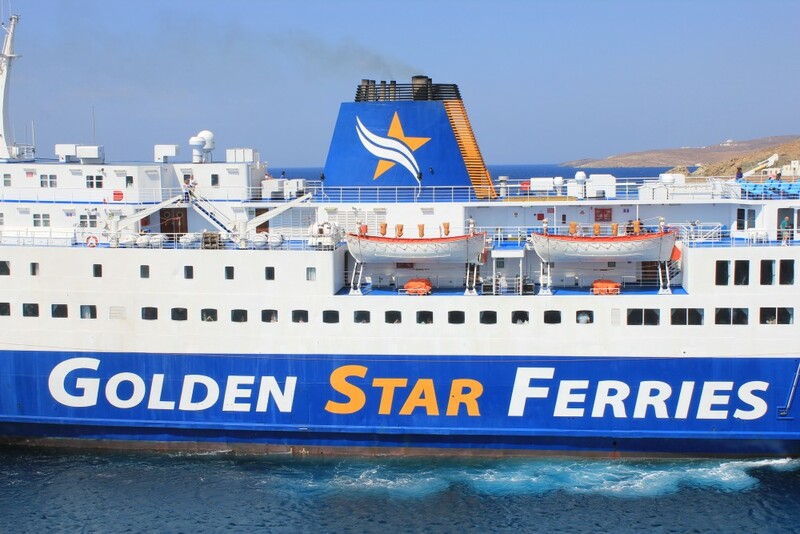 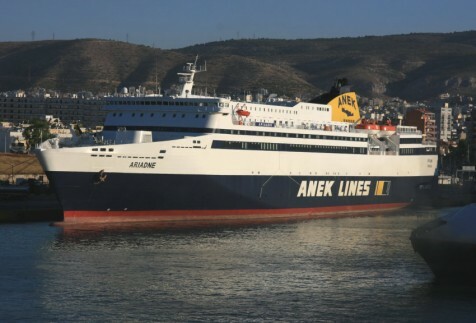 New competition has emerged this year in the shape of the rebuilt Adamantios Korais of expansion-minded Zante Ferries which has effectively replaced the Romilda, but the Agios Georgios remains the only conventional ship to offer daily departures from Piraeus. 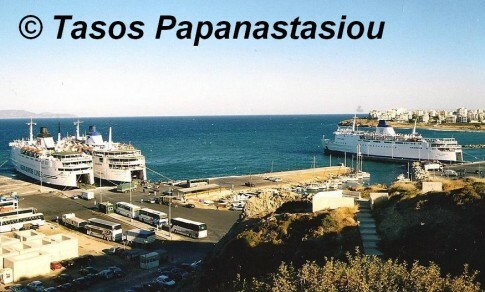 There are also regular calls at Milos by ANEK’s passing Prevelis which has taken over a roundabout Piraeus-Rhodes circuit similar to that previously operated by the Vitsentzos Kornaros. 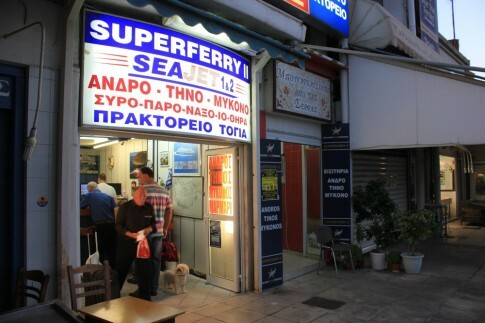 Fast ferry connections are offerred this year by the Speedrunner IV (ex-SuperSeaCat Four) and Hellenic Seaways, having long left the conventional sailings to the Agios Georgios, provide a daily round trip with the Highspeed 3, whilst Sea Jets‘ passenger only Super Jet daily connects Piraeus-Milos-Folegandros (-Santorini-Amorgos-Koufonisi). 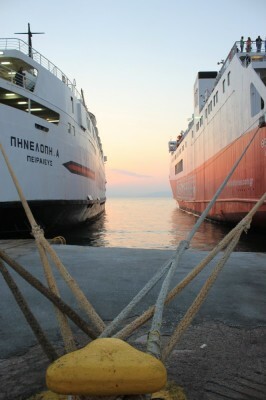 Peter Kidman sends these pictures of the Agios Georgios, taken in July. 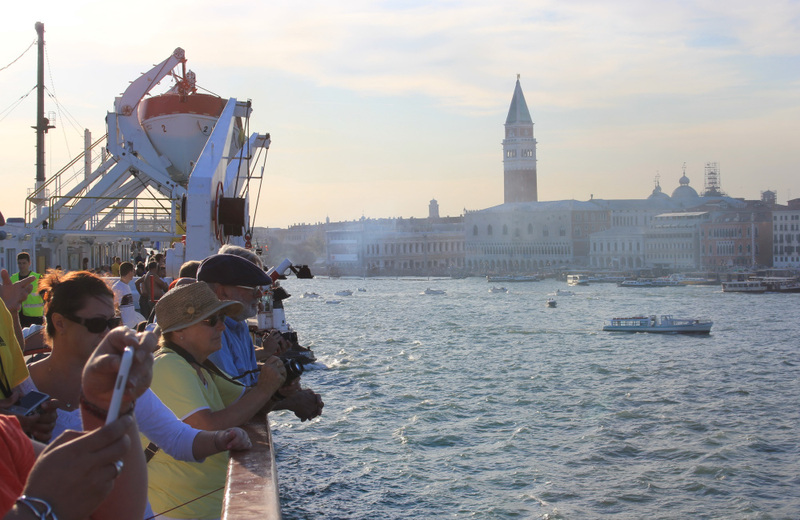 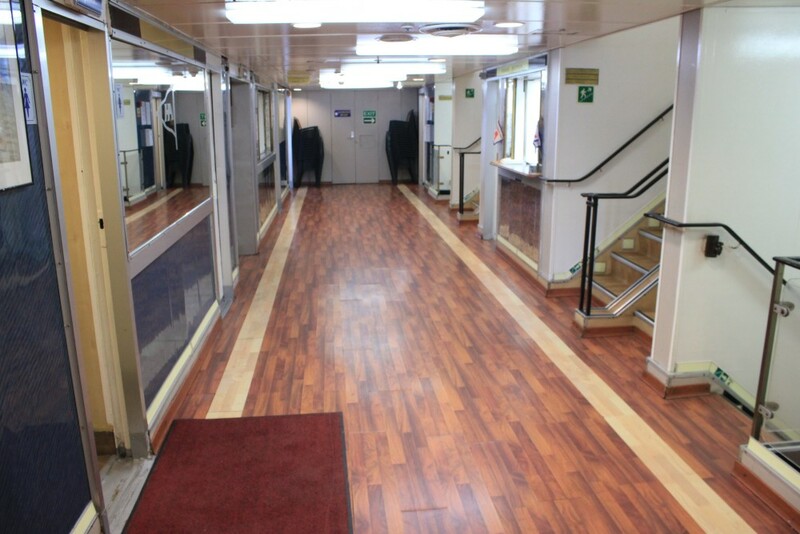 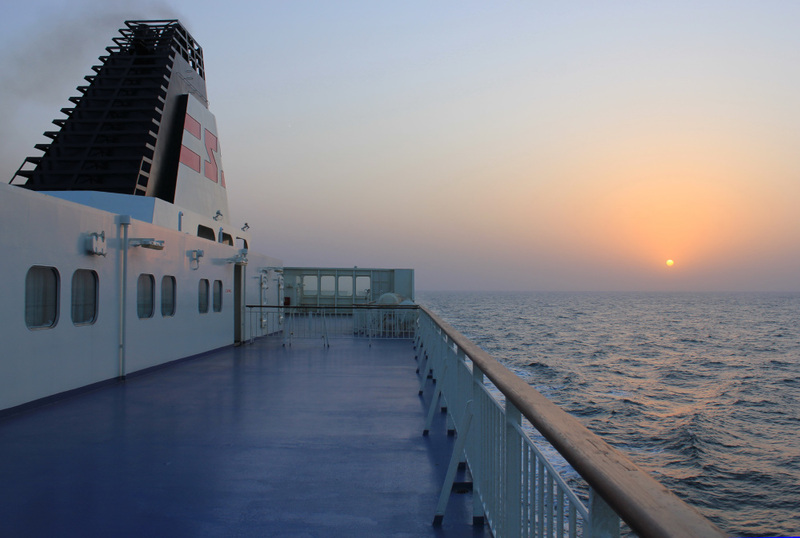 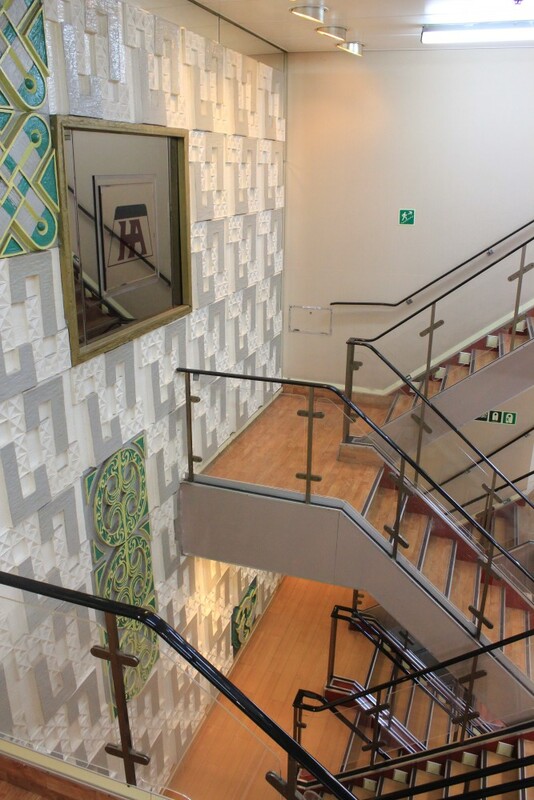 VSL made further investment during the ship’s refit earlier in the year, which resulted in the addition of eight rather unsightly square windows on the starboard side forward enclosed promenade (part of the First Class accommodation). 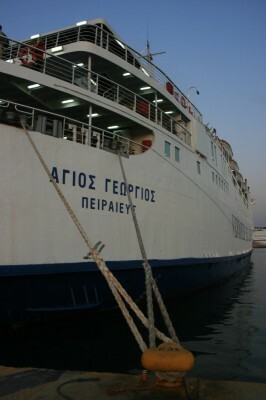 A similar view of the ship at Milos before the recent modifications. Over at Athens’ secondary port, the Penelope A (ex-Horsa) remains on the Rafina-Andros-Tinos-Mykonos route she has maintained ever since she first came to Greece in 1992. Competition on this routing remains hot, but unchanged from last year, with Blue Star’s Superferry II (ex-Prince Laurent) theoretically perhaps the main rival, with the insurgent Aqua Jewel and Theologos P of Alpha Ferries and Cyclades Fast Ferries (sic) respectively also competing. 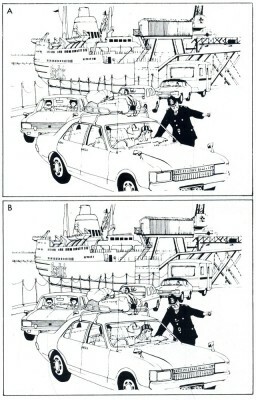 The Seajet 2 and Highspeed 2 also buzz around in and amongst the conventional ships. 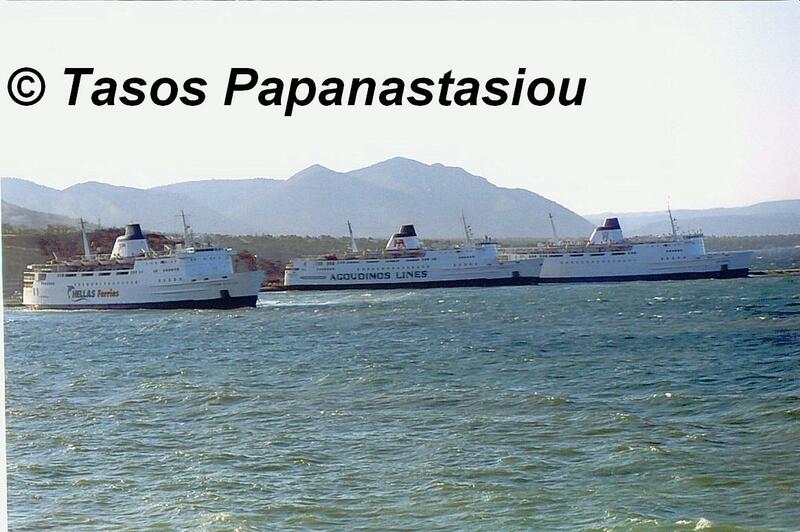 Patrick Vandeputte has sent these recent images of the Penelope A at Tinos. 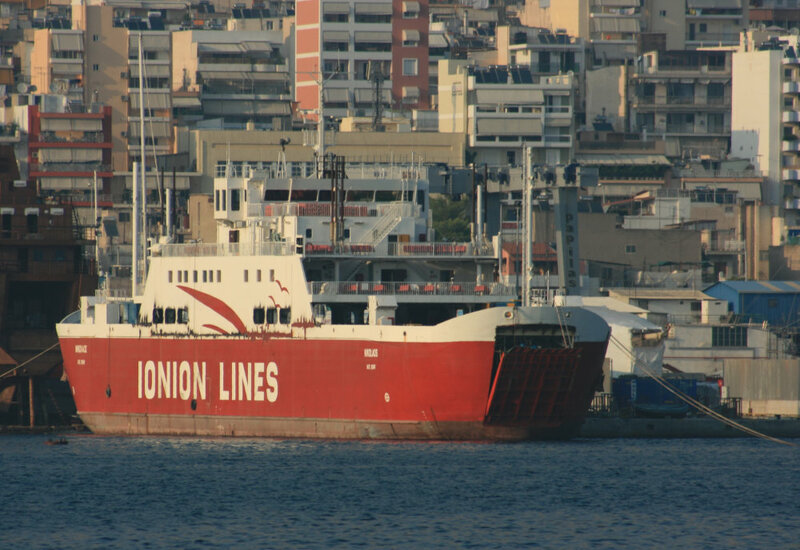 The third sister, the more elusive Apollon (ex-Senlac) has been in service for European Seaways throughout the Summer, operating alongside the rather less appealing Ionis between Bari (Italy) and the port city of Durres (Albania). 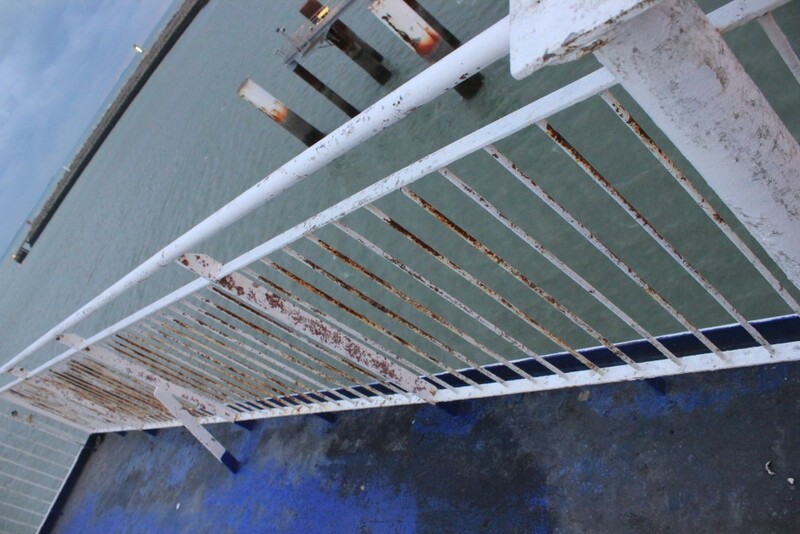 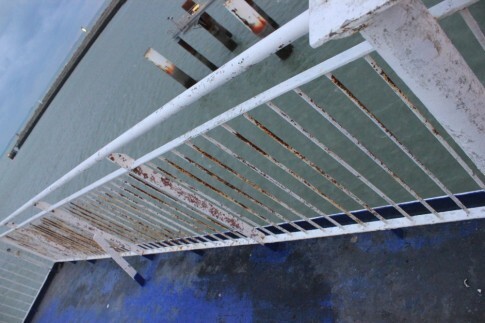 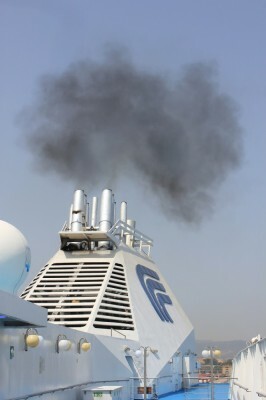 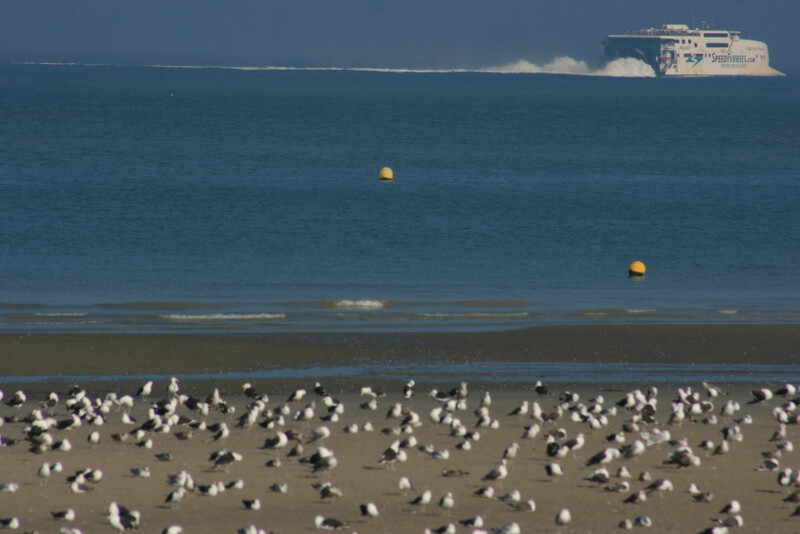 The Dover Ferry Photos Forum has recent pictures here (registration required). 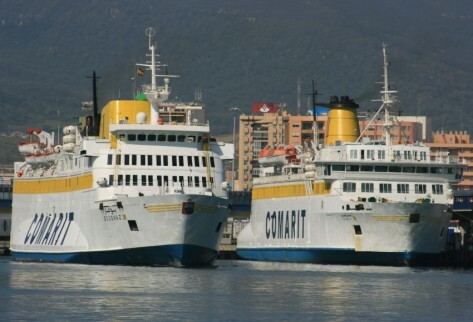 These are but two of at least thirteen conventional ships operating on the Bari-Durres route this Summer, of which the most notable to North Europeans perhaps are the Rigel (ex-Baltic Kristina/Ilich/Bore I) and the Arberia (ex-Wasa Queen/Orient Express/Bore Star). 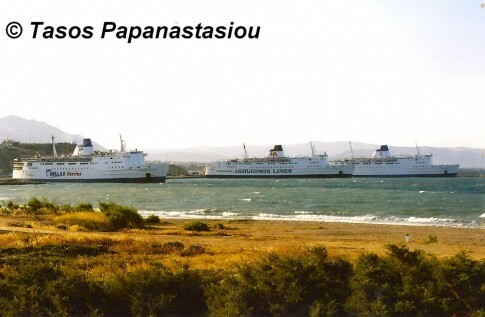 With thanks to Peter Kidman and Patrick Vandeputte for the 2009 pictures of the Agios Georgios and Penelope A respectively. 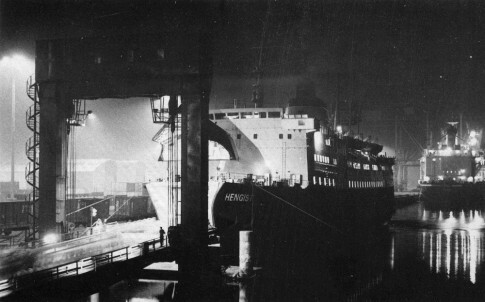 Although built together for Sealink, being delivered in 1972-73, the Hengist, Horsa and Senlac never operated together as such, the Senlac being Newhaven-based. 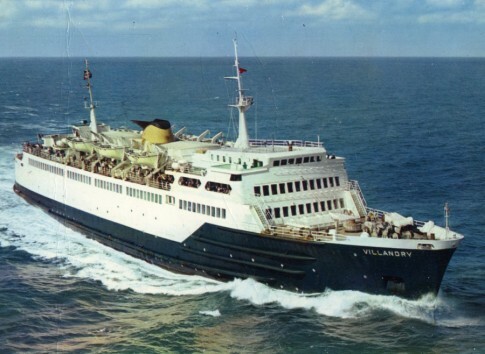 There were a few occasions when the Senlac ventured east, with Newhaven-Boulogne even being operated as an emergency service on occasion when Dieppe was out of action. 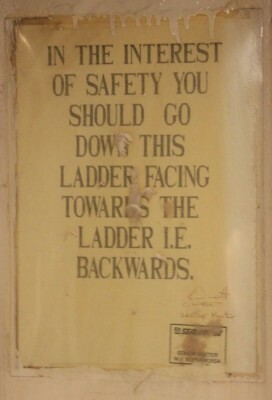 However these were never anything other than temporary measures. 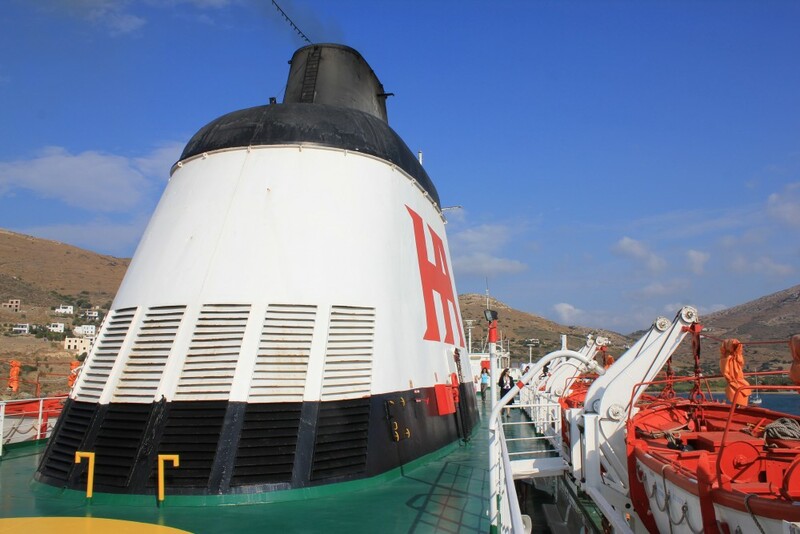 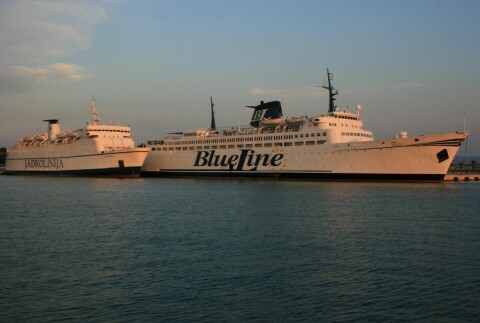 When Hellas Ferries was created in 1999/2000, the ships, by then all operating for different Greek operators, once again came together in one fleet. 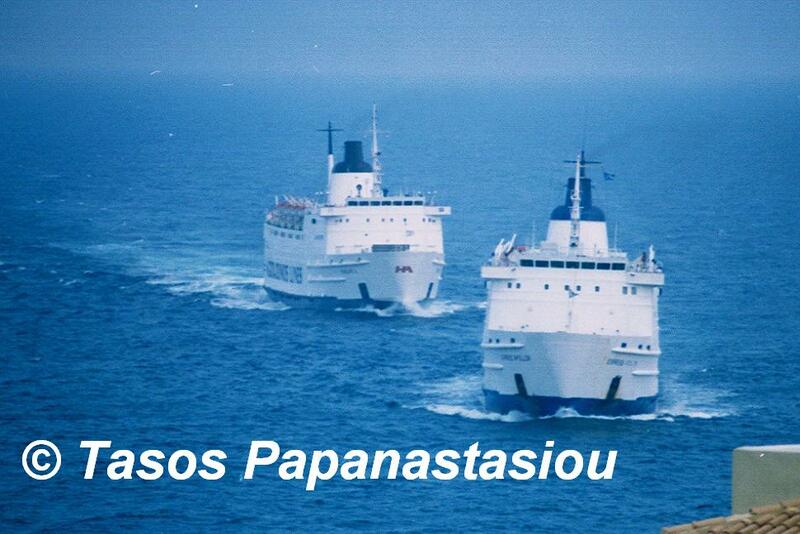 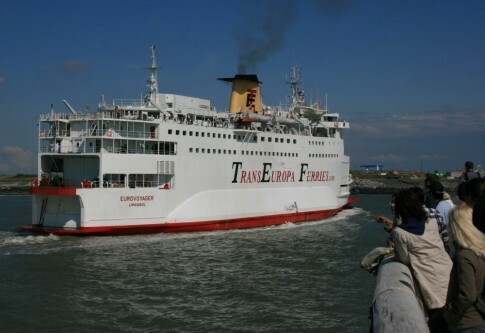 Agapitos Lines’ Panagia Ekatontapiliani (ex-Hengist) became the Express Artemis, Agoudimos Lines’ Penelope A (ex-Horsa) became the Express Penelope whilst Agapitos Express Ferries’ Express Apollon (ex-Senlac) retained her name. 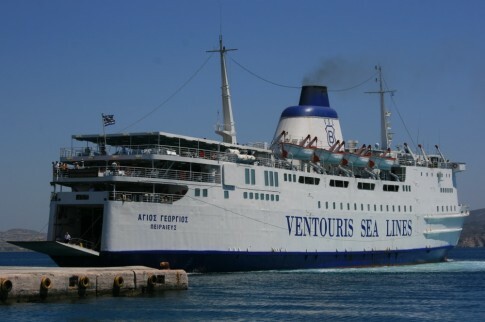 They remained together in the same fleet, generally operating rather different itineraries to one another, until early 2004, when the former Hengist and Horsa were sold by Hellas Ferries to local competitors – the Hengist to her original Greek owners, Ventouris Sea Lines, and the Horsa back to Agoudimos Lines. 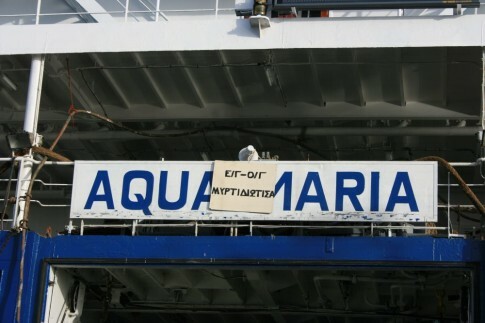 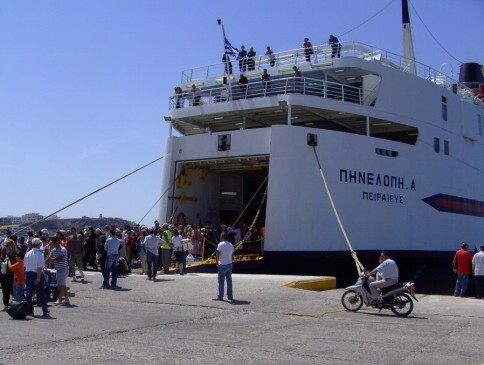 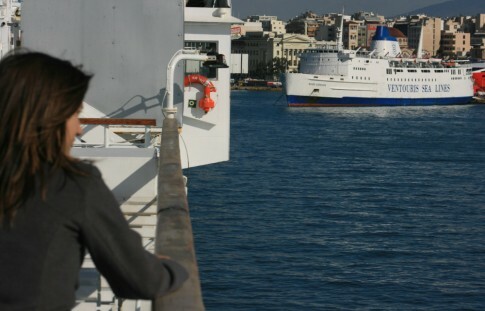 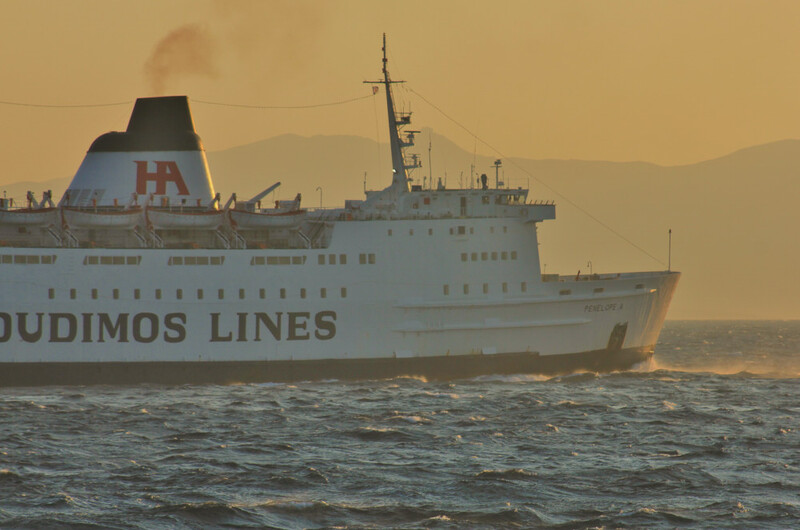 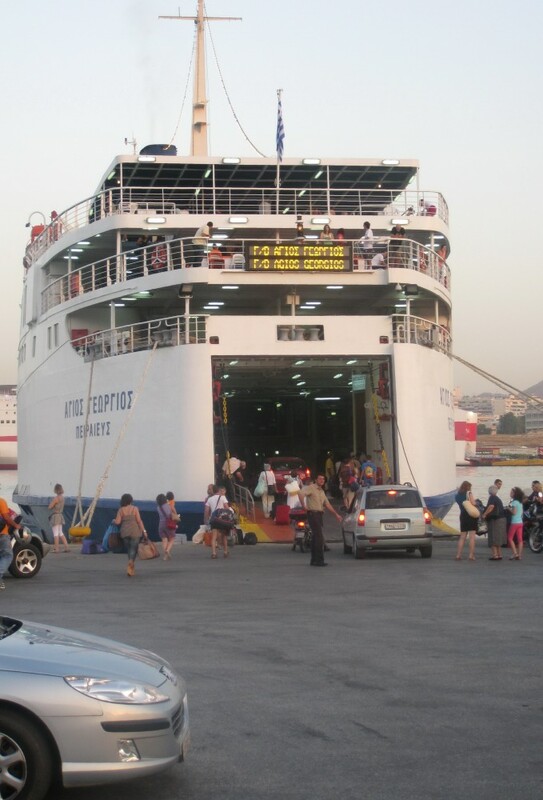 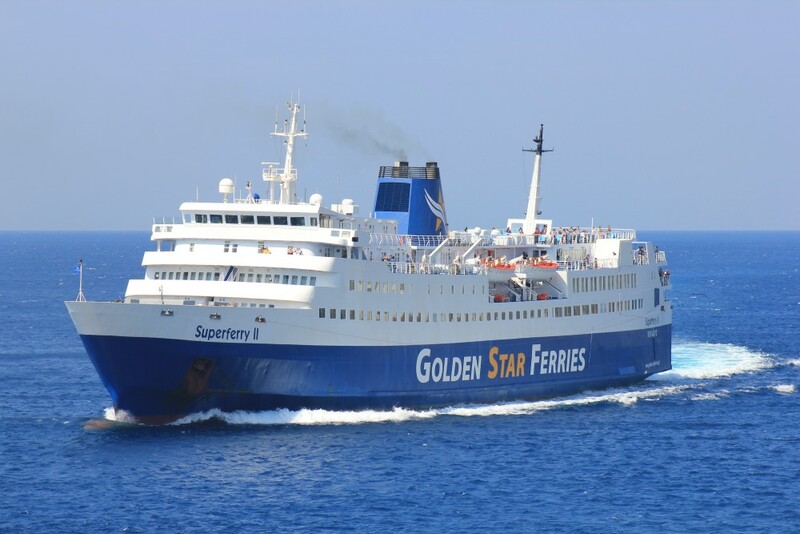 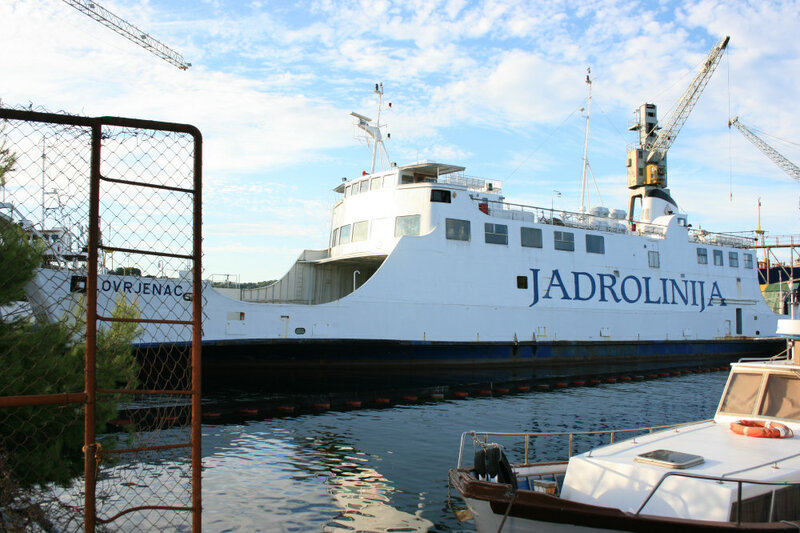 2004 was Olympic year and for that season only Hellas Ferries made the decision to deploy two ships out of Rafina rather than the main but busy port of Piraeus, namely the Express Apollon and the Express Aphrodite (ex-St Columba). Rafina had been the home to the Penelope A/Express Penelope for the duration of her Greek career. 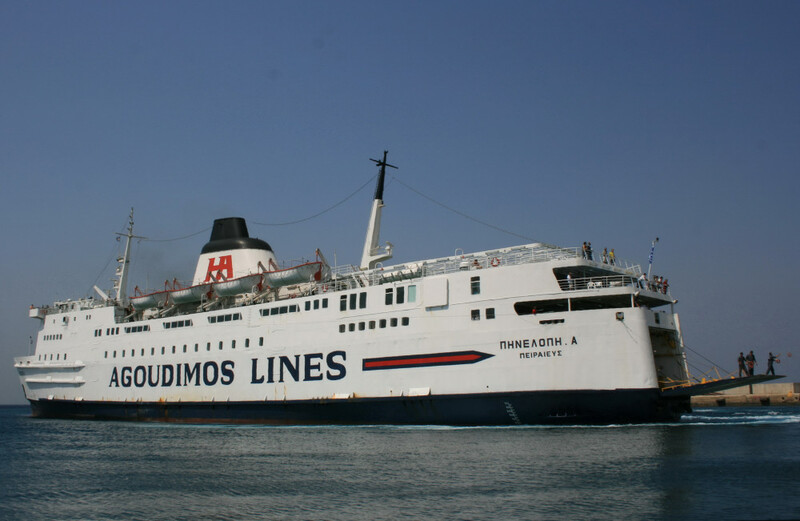 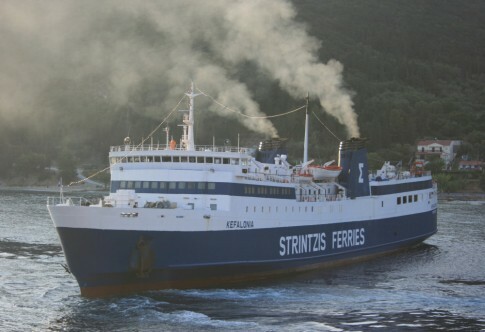 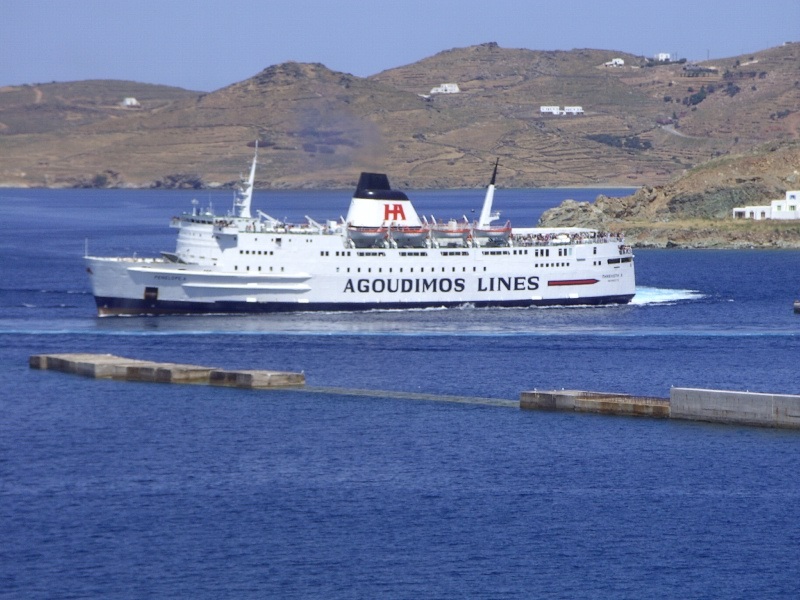 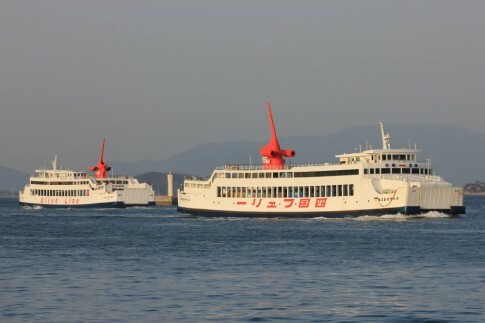 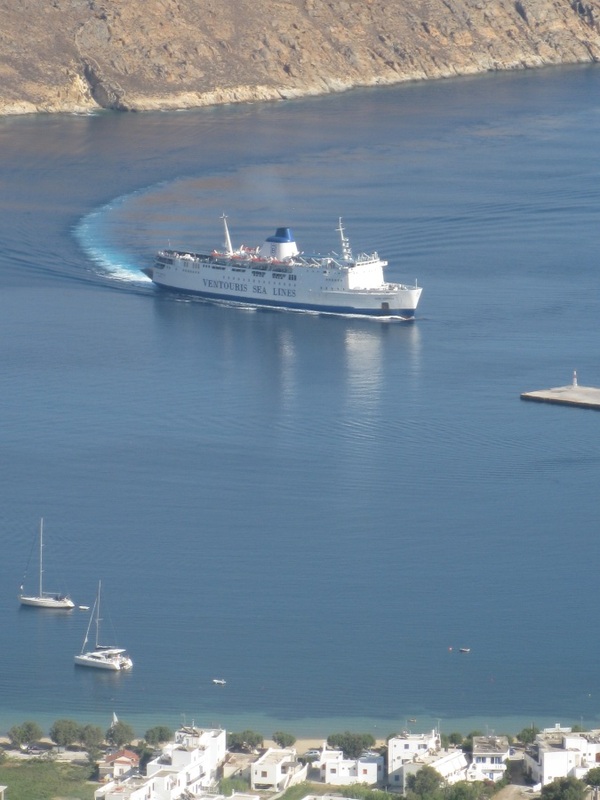 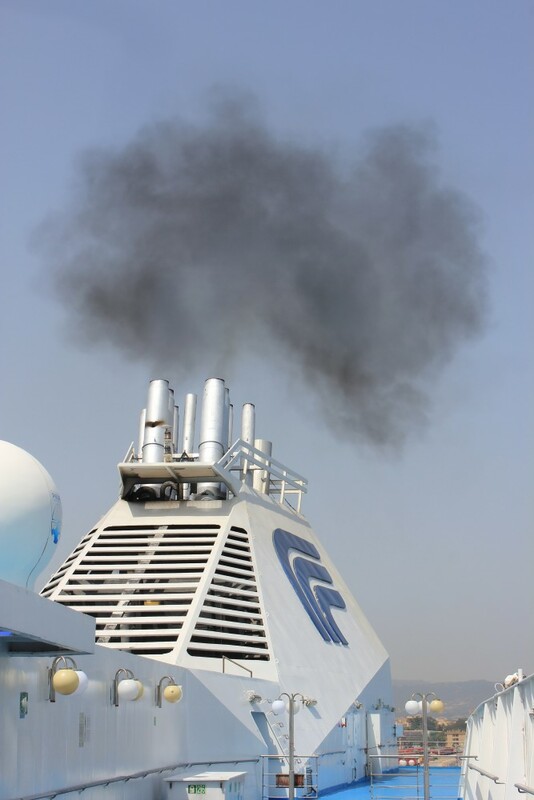 Along with the Superferry II (ex-Prince Laurent) there were therefore four ex-Sealink ships engaged in the Rafina-Andros-Tinos-Mykonos trade that Summer. 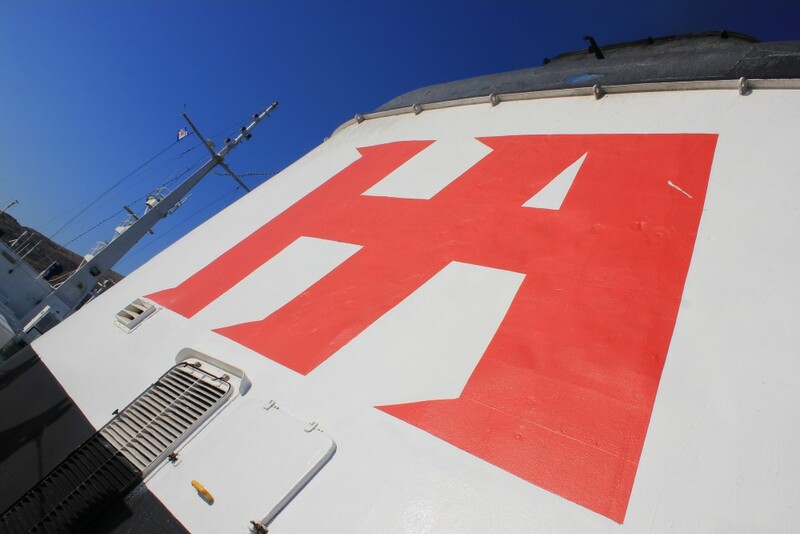 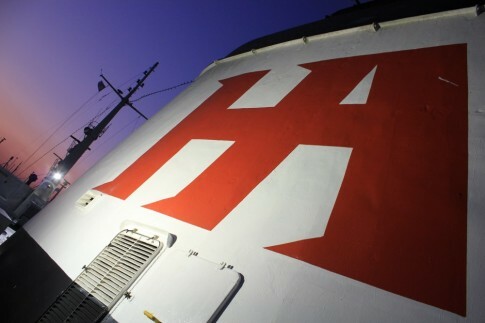 The ‘H Class’ connection was complete when the Hengist, renamed Agios Georgios, was given a licence to operate Rafina-Paros-Naxos-Santorini sailings, being hurriedly introduced into service on 8 July. 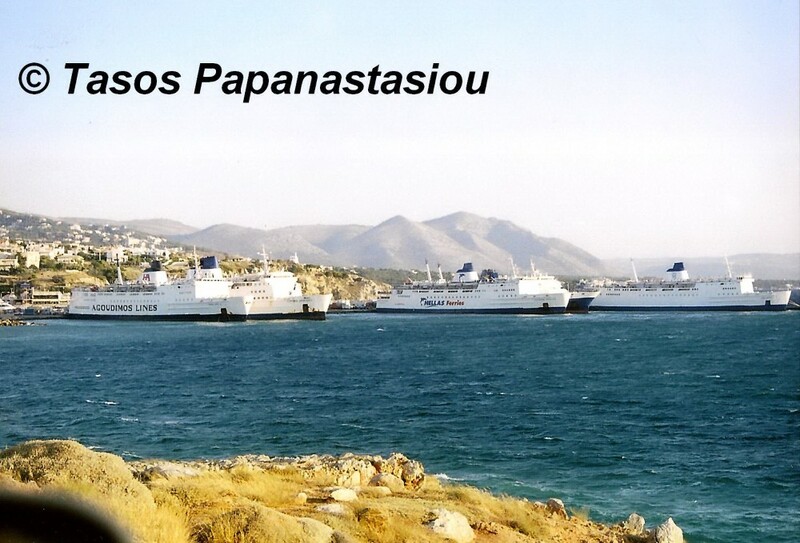 Thus for one glorious Summer, late in their careers, the sisters were based together at the same port. 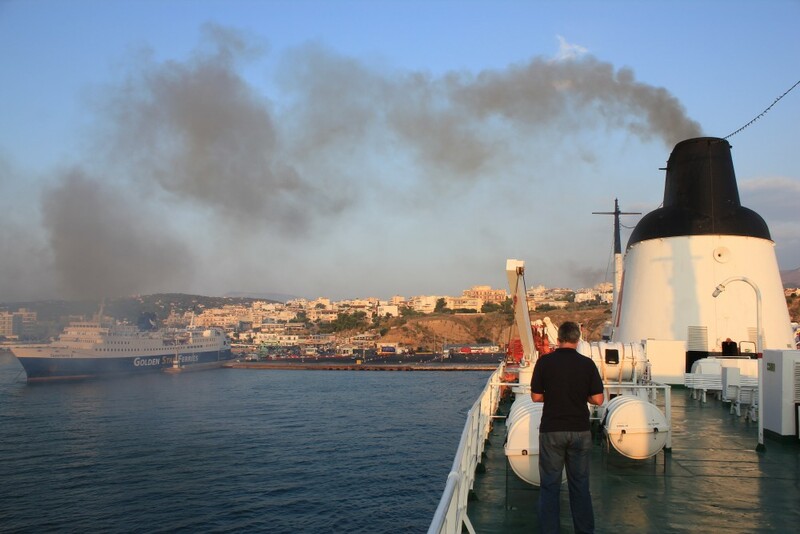 Tasos Papanastasiou was able to capture these unique images of the three ships, once again operating for different companies, but this time coming head-to-head against each other in Rafina. 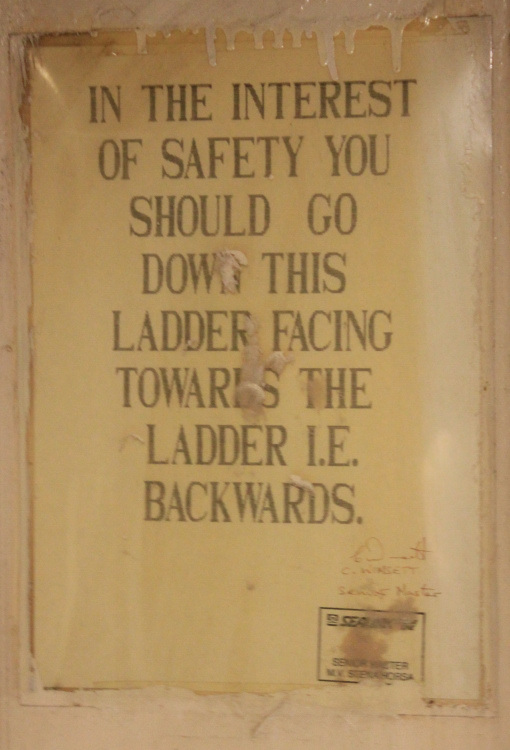 For each picture, click for a larger image. The Penelope A (ex-Horsa, left) chases the Express Apollon (ex-Senlac, right) into port. ... it's single file only. 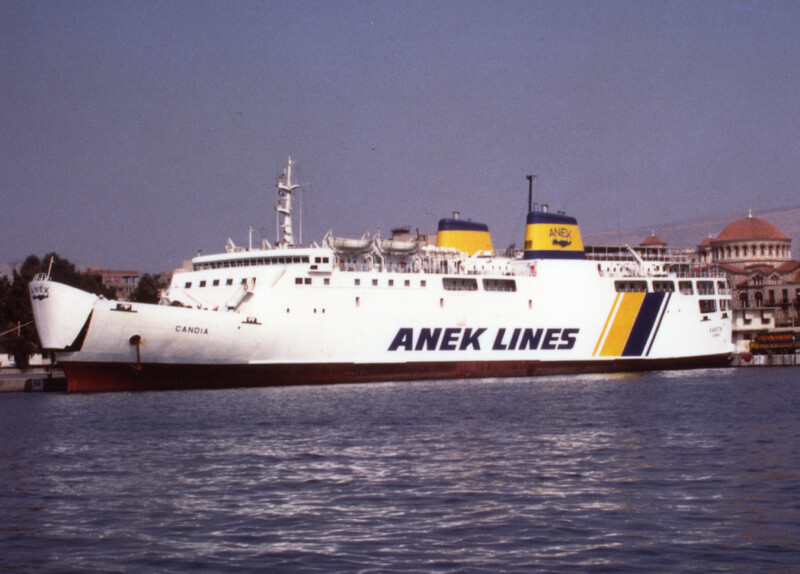 Lastly a unique, never to be repeated view showing five ex-Sealink ships together at Rafina. From left to right: the Penelope A, Express Aphrodite (ex-St Columba), Express Apollon, Superferry II (ex-Prince Laurent) and Agios Georgios. 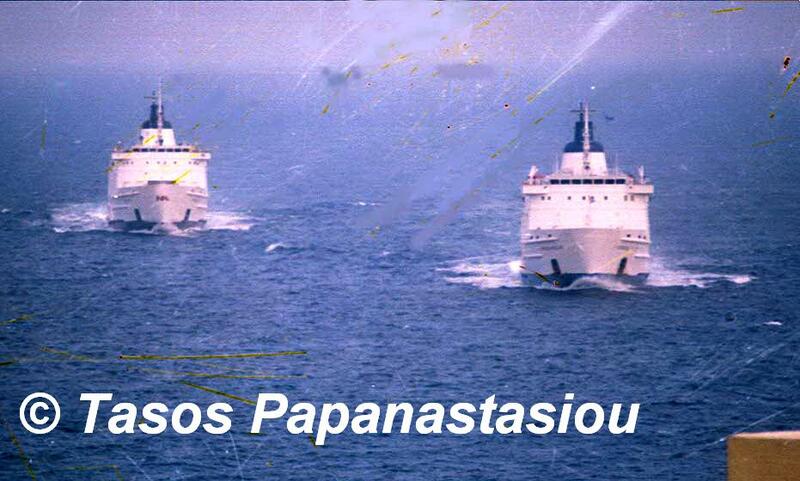 Images courtesy Tasos Papanastasiou & originally posted to nautilia.gr.